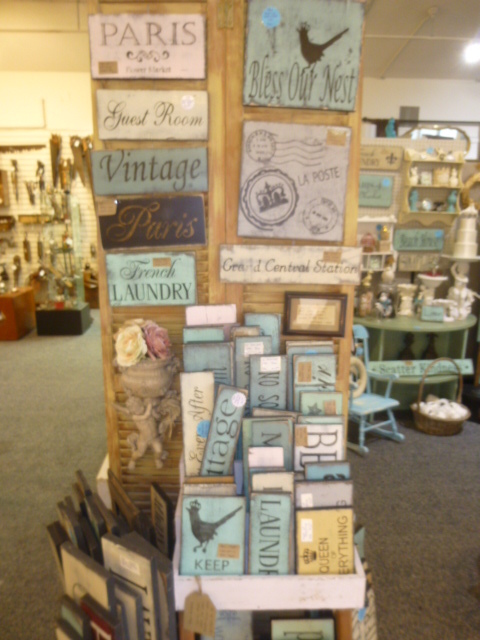 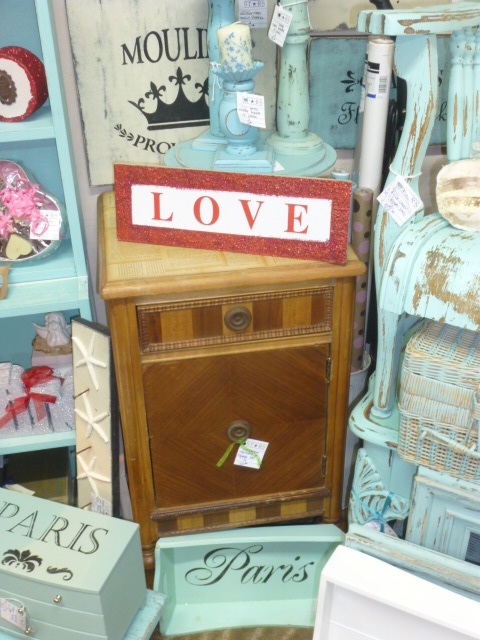 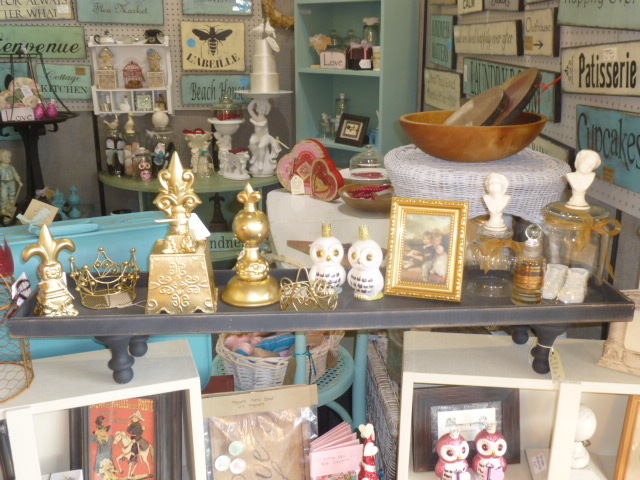 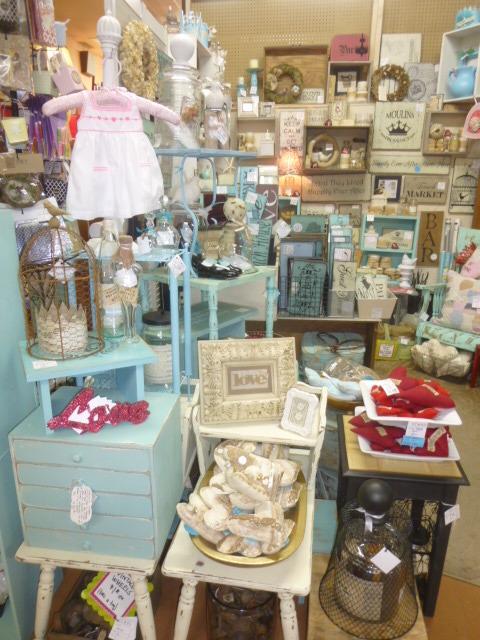 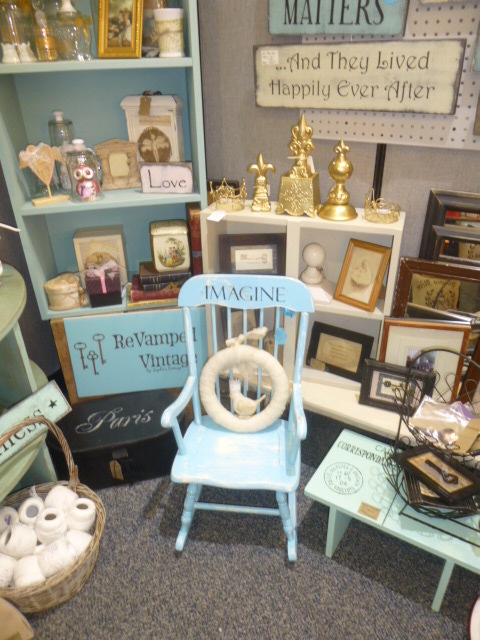 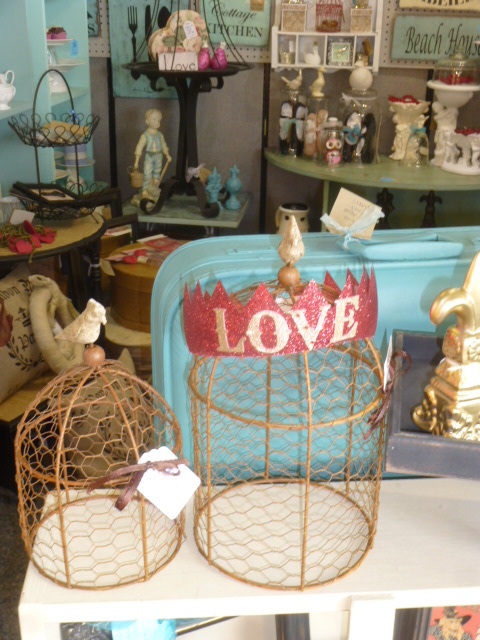 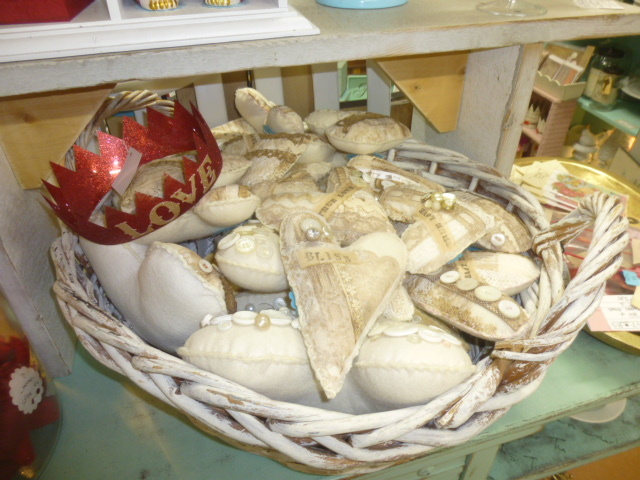 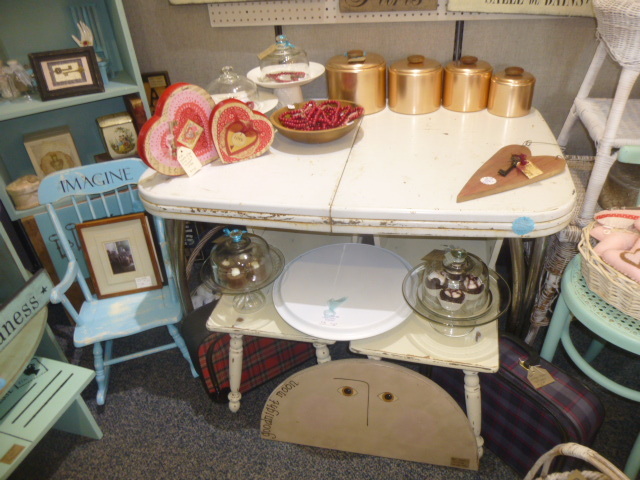 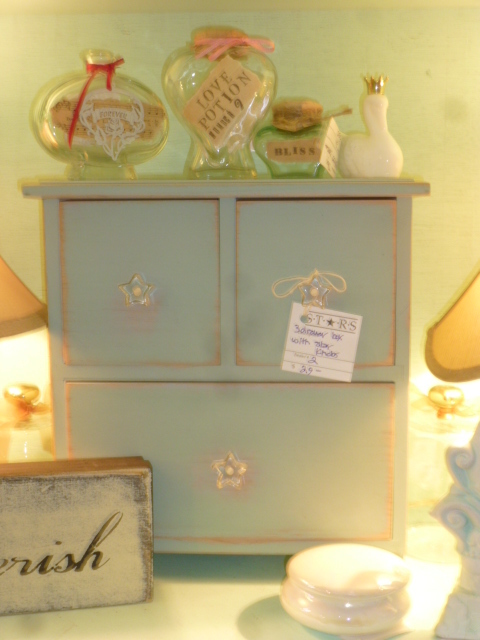 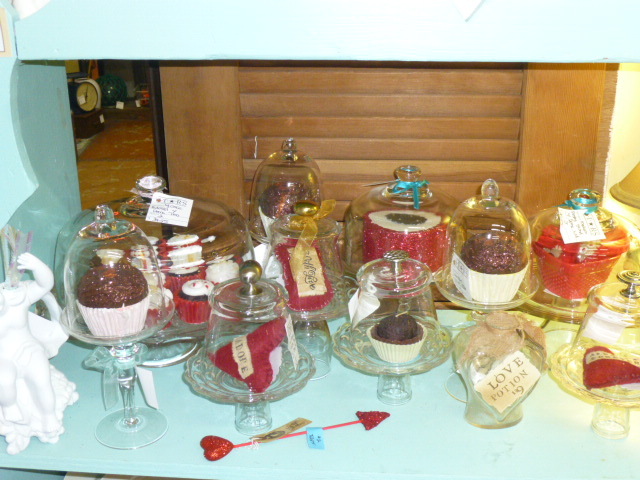 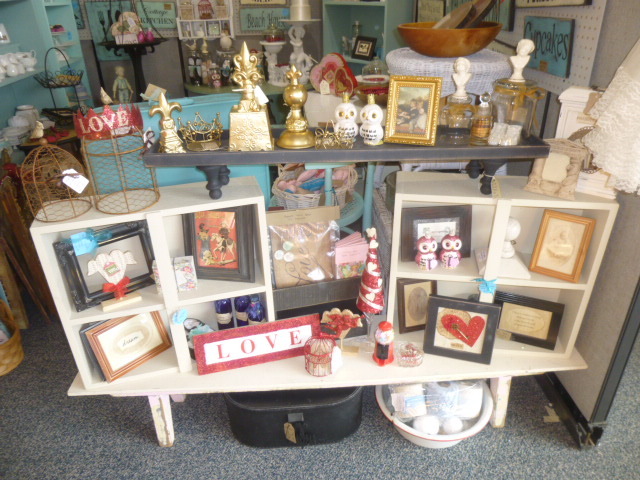 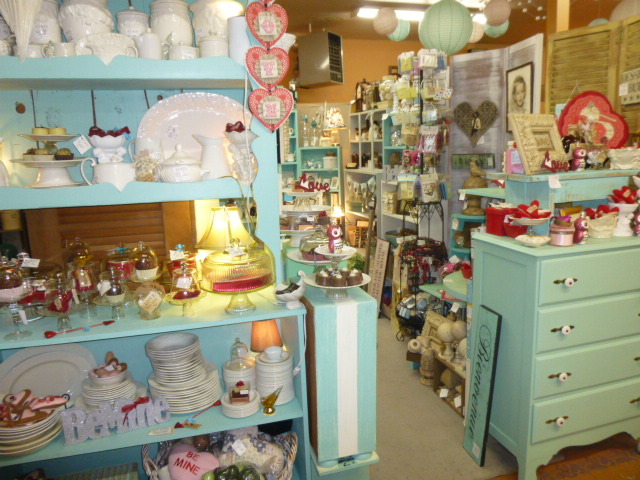 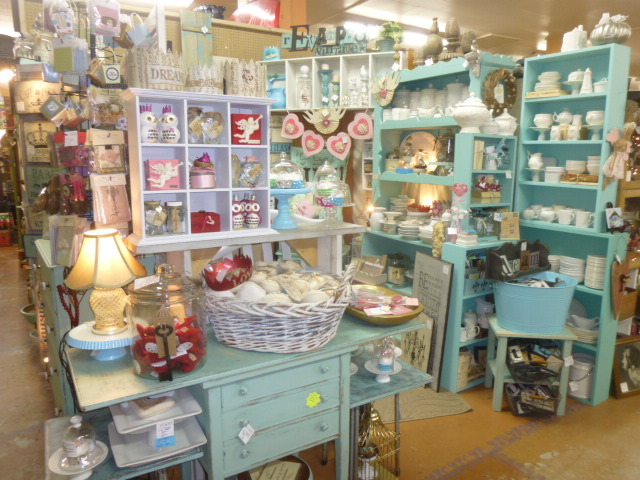 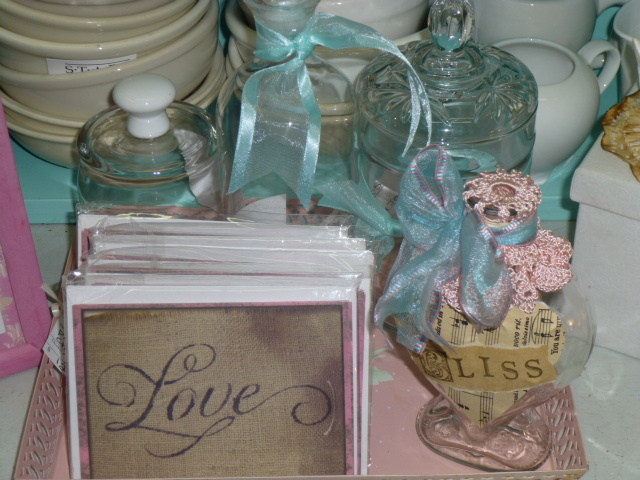 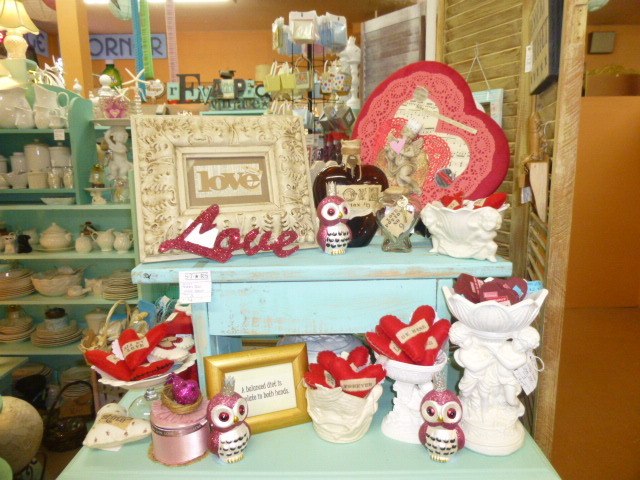 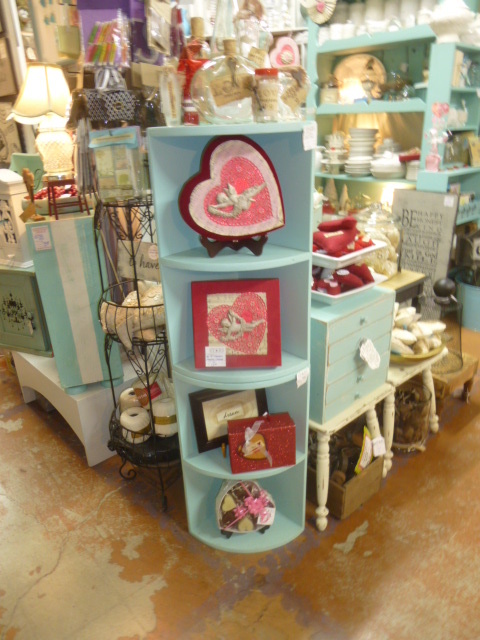 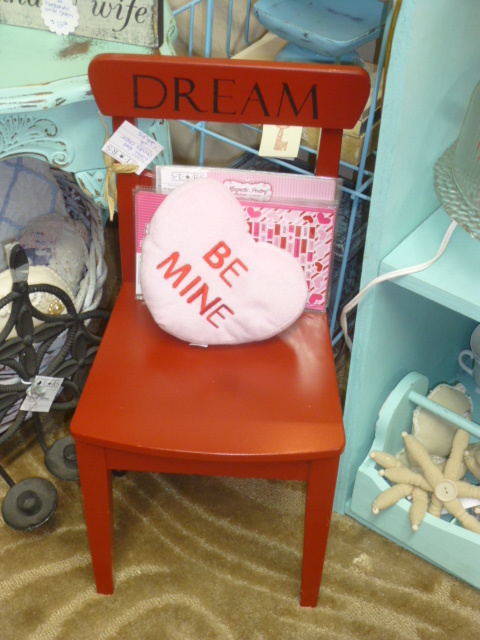 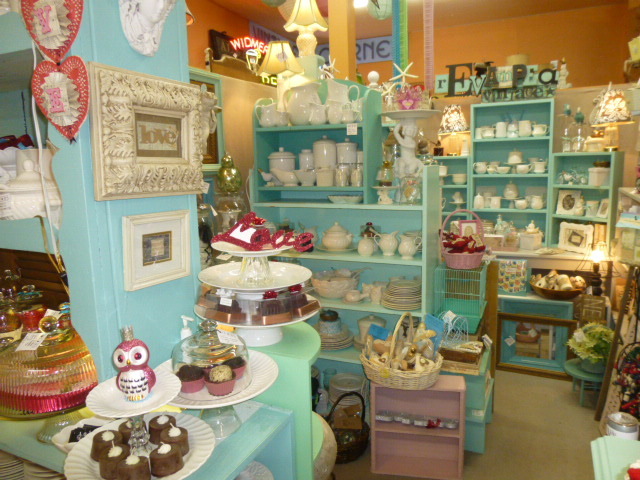 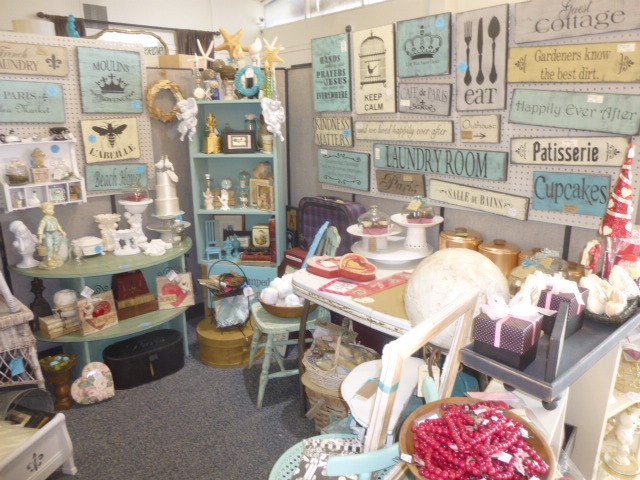 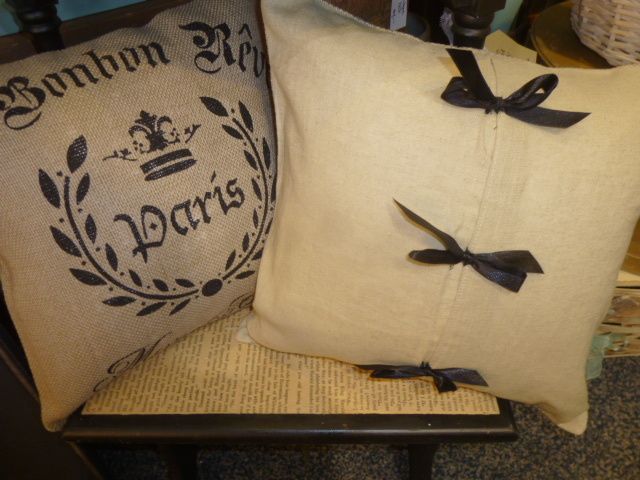 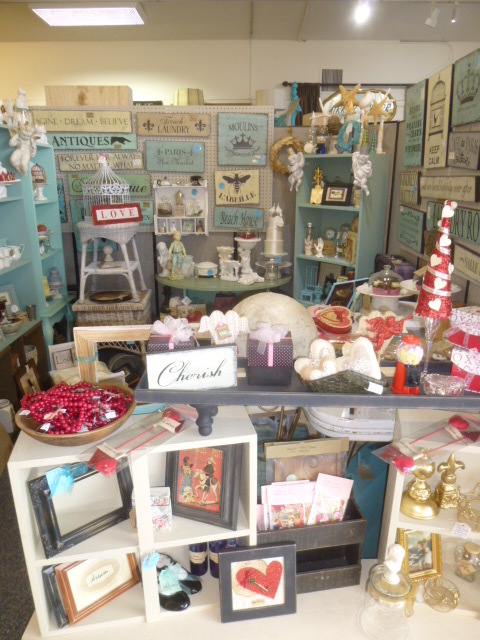 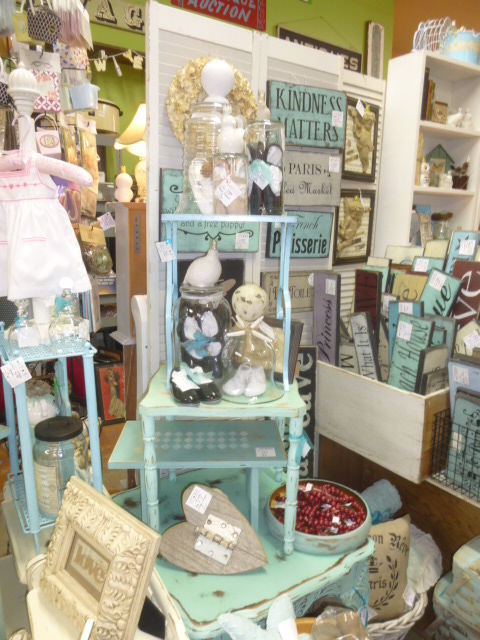 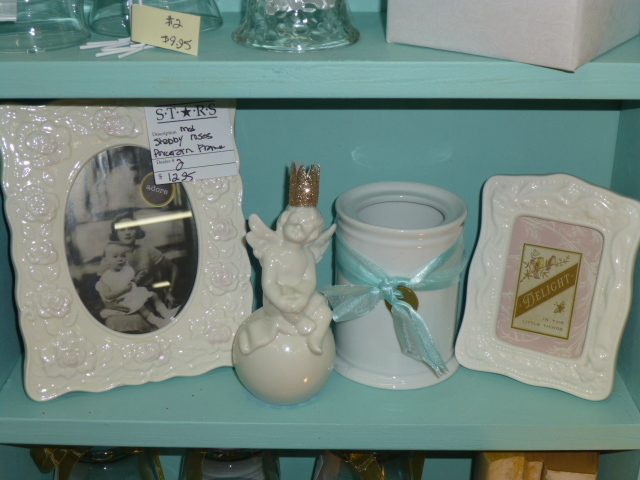 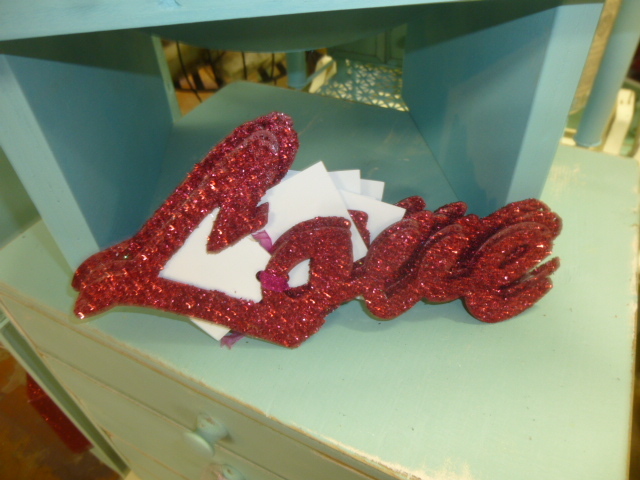 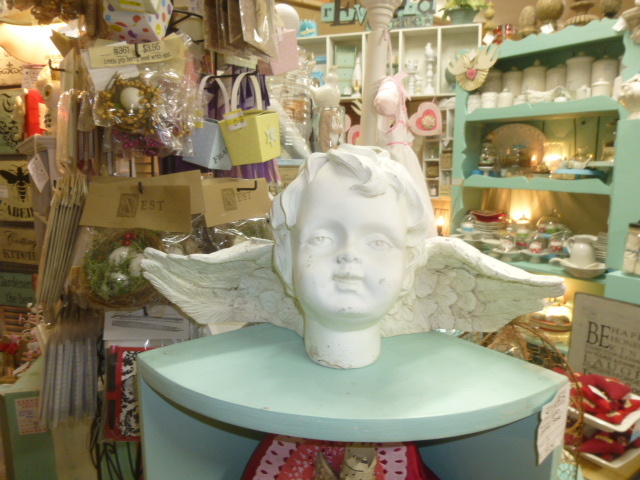 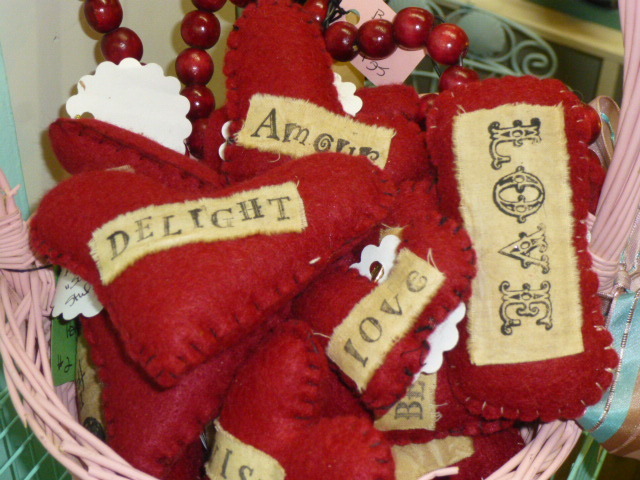 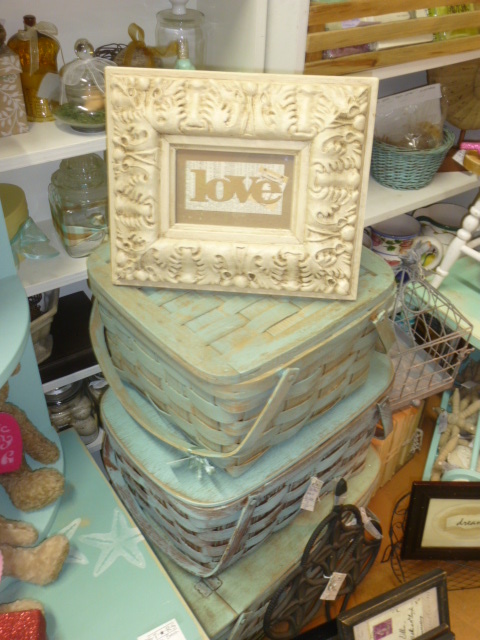 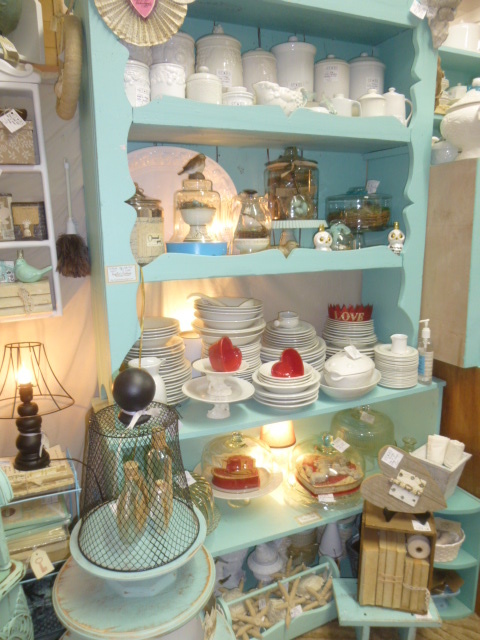 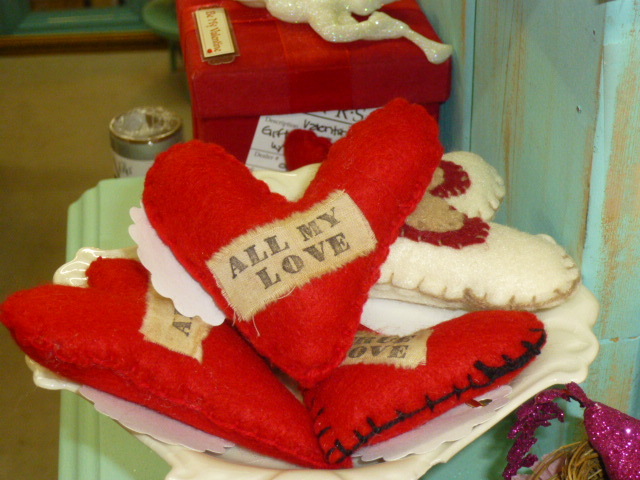 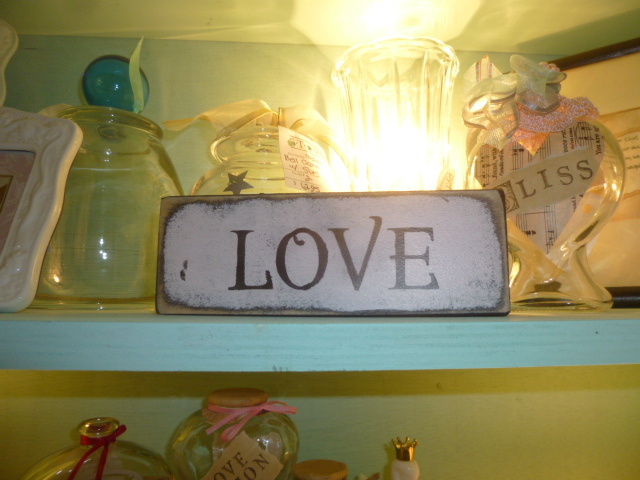 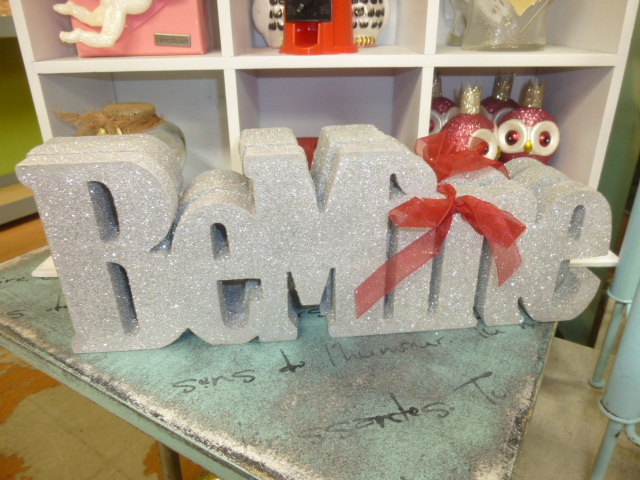 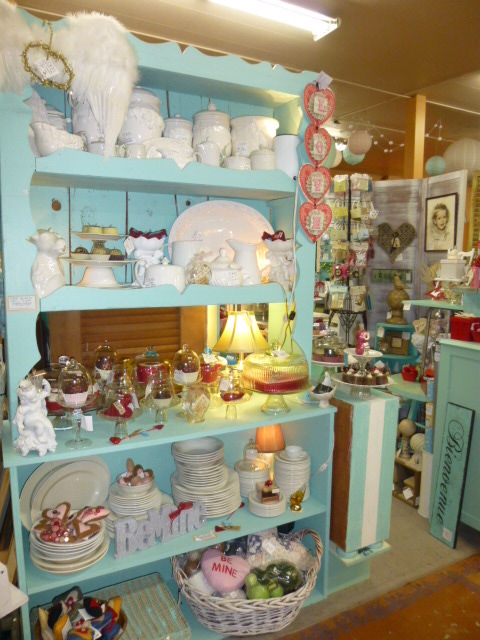 Lots of fun Valentine gifts and home decor items just stocked in my booth at Stars. 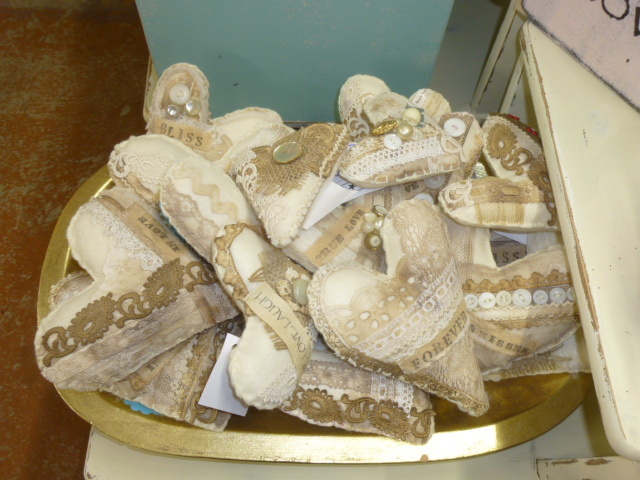 The tea stained lace quilt hearts that I’ve shown in a previous post. 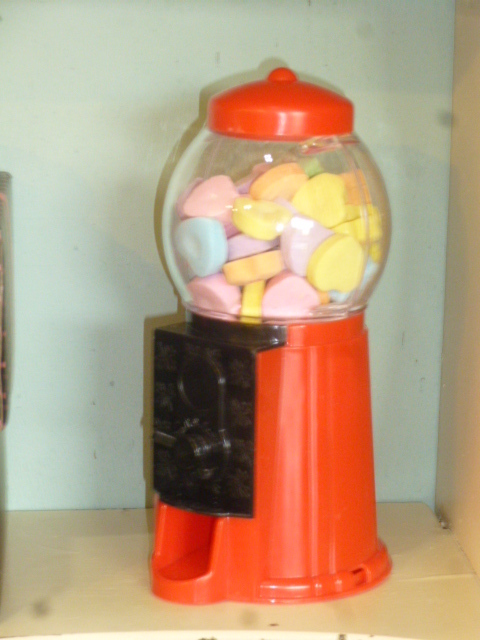 These are ONLY available at Stars. 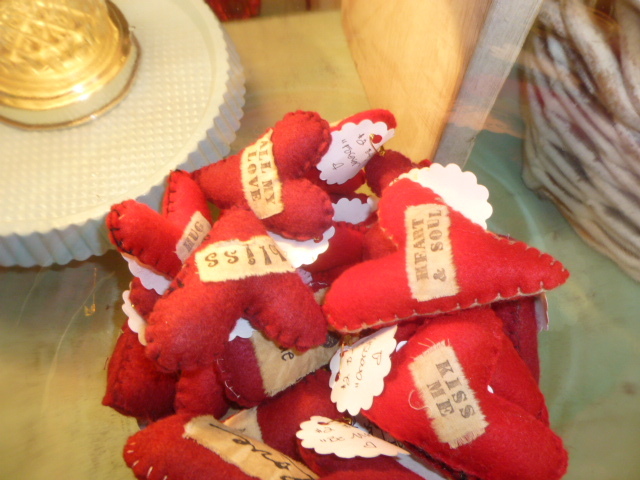 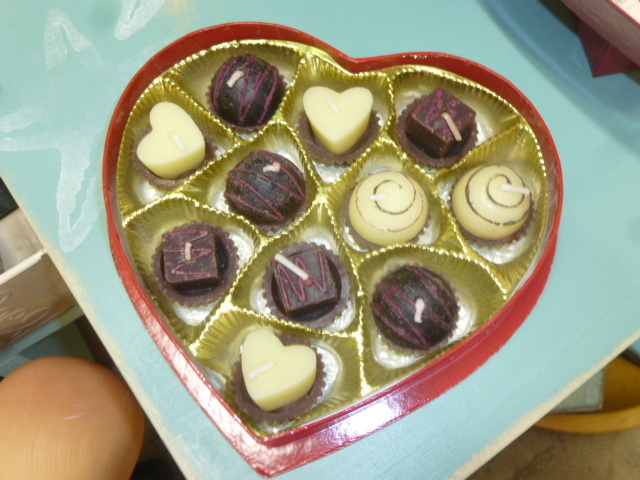 I also have some of the small red ‘conversation hearts’ at Stars. 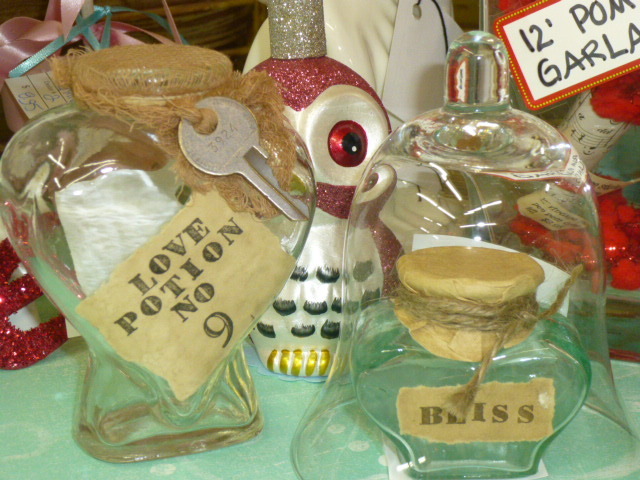 Loaded them into a HUGE 2 gallon mercantile jar. 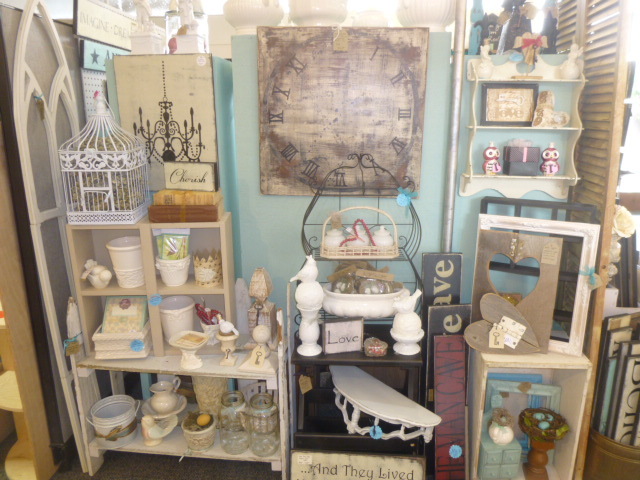 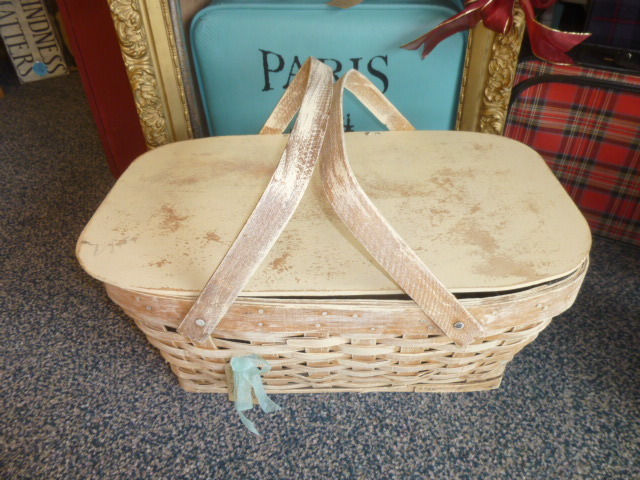 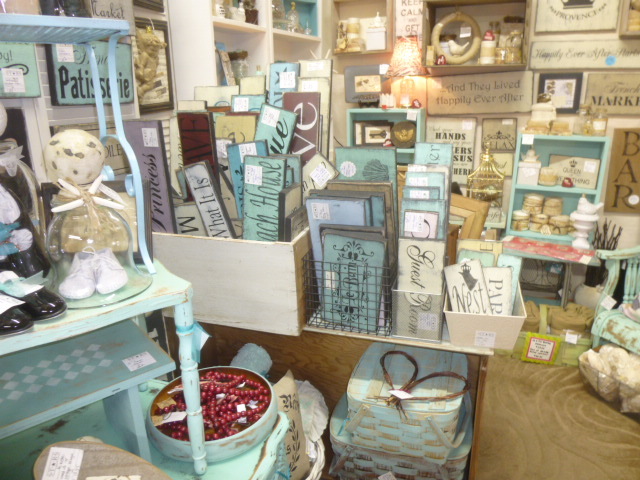 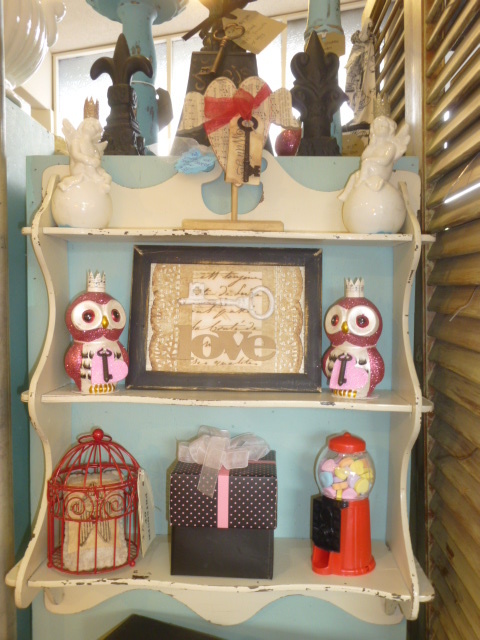 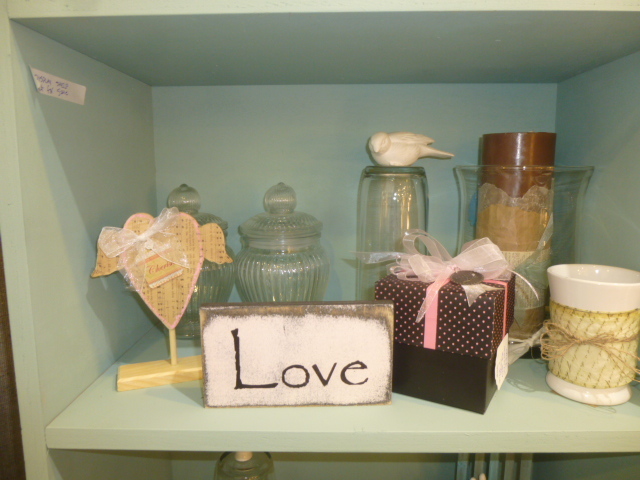 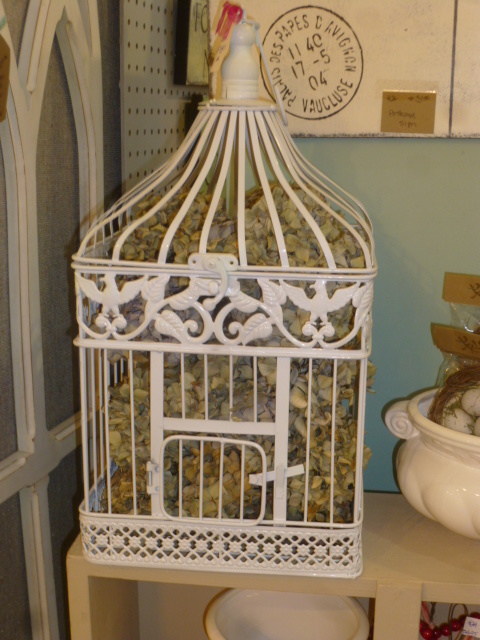 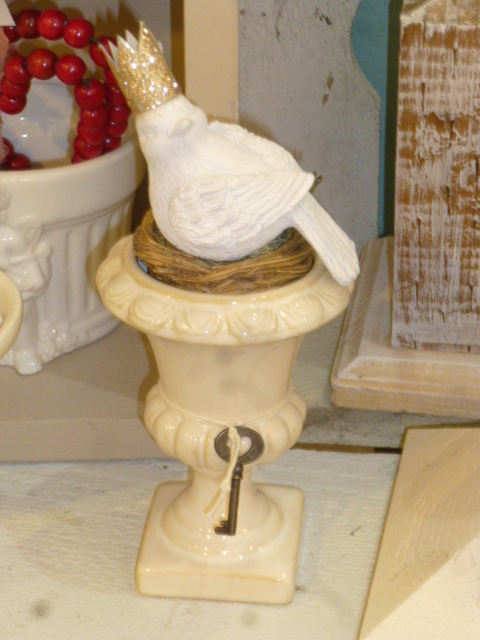 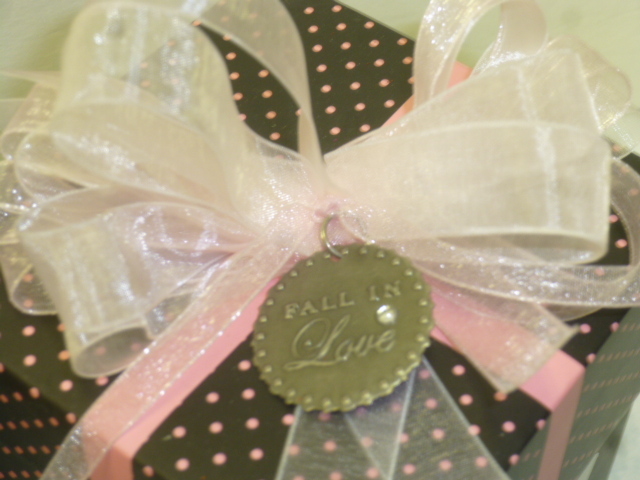 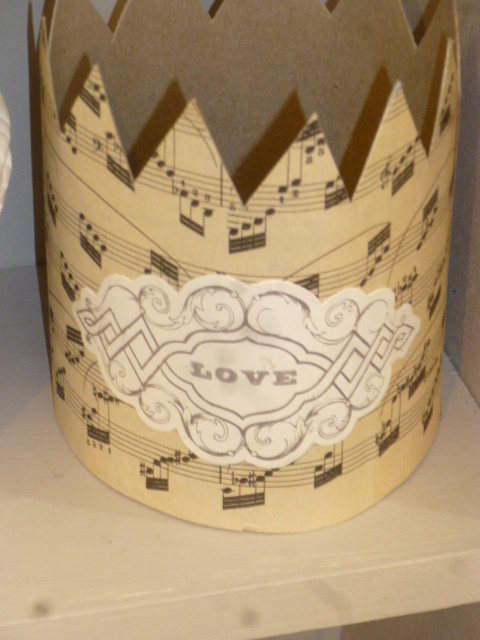 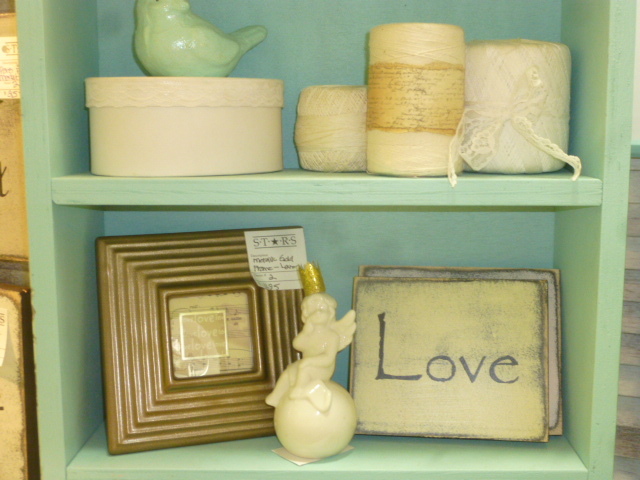 Lots of little bits and bobs to decorate with or give as gifts; including several pretty gift boxes. 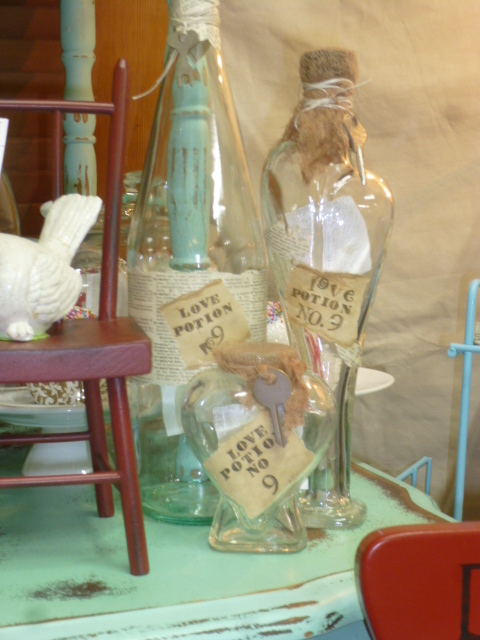 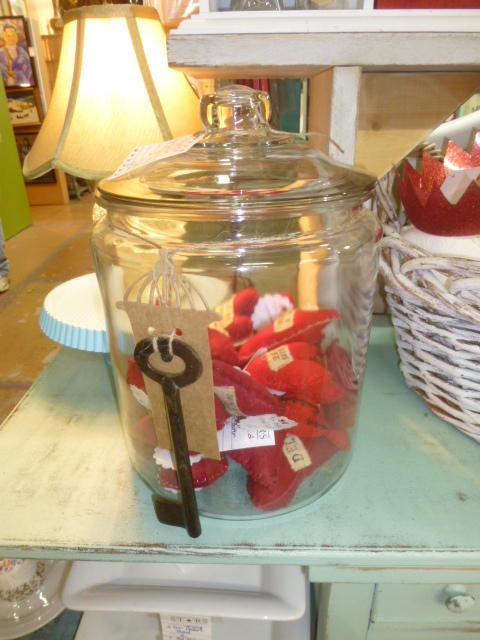 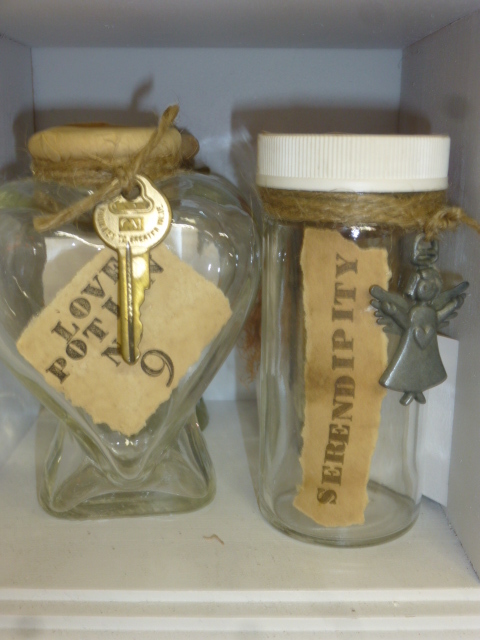 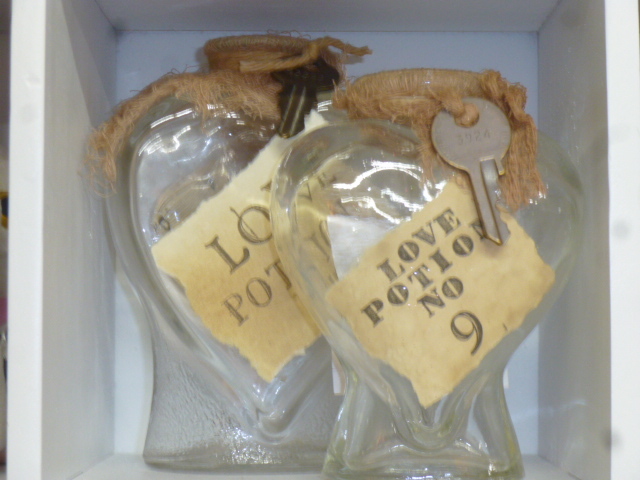 Love potion #9 bottles adorned with vintage keys. 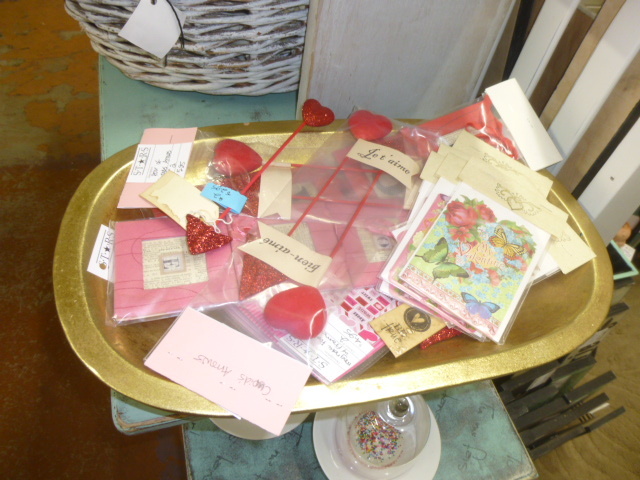 A big gold tray full of assorted fun stuff to dig through. 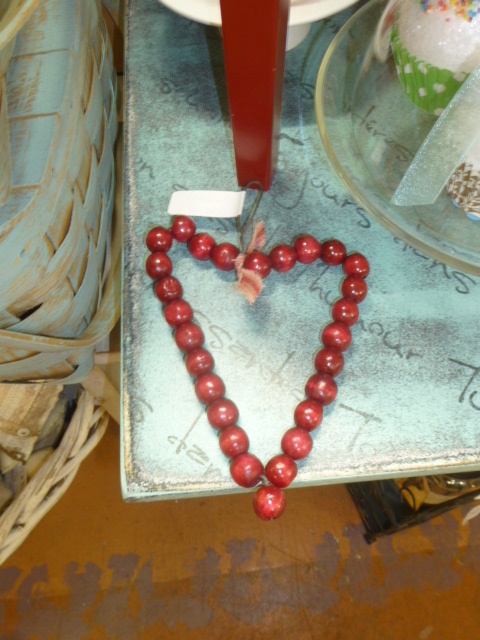 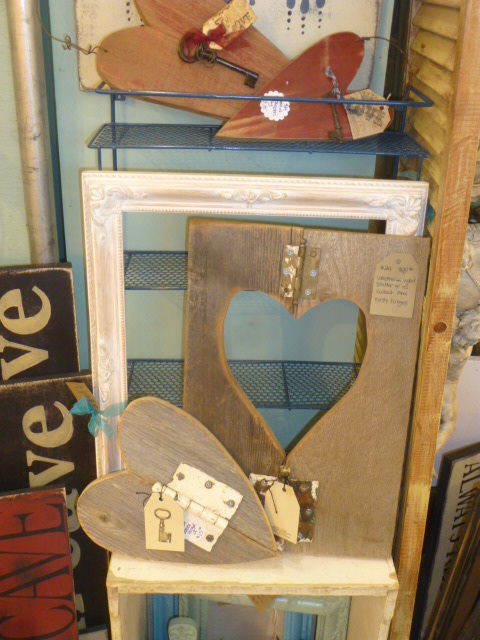 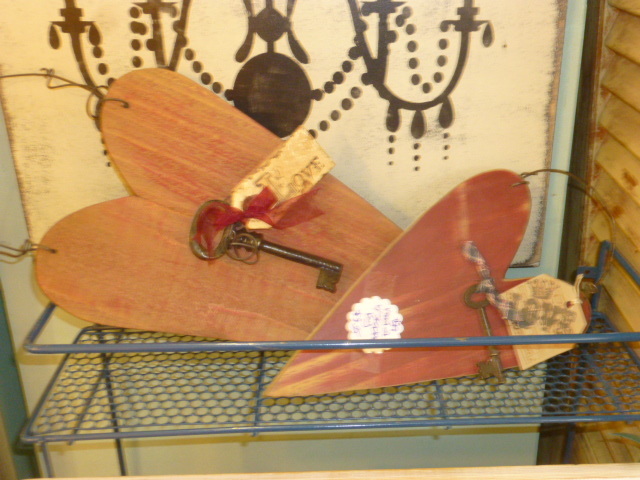 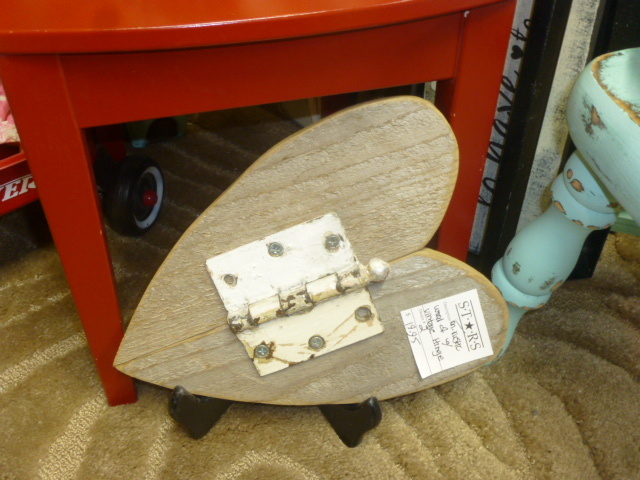 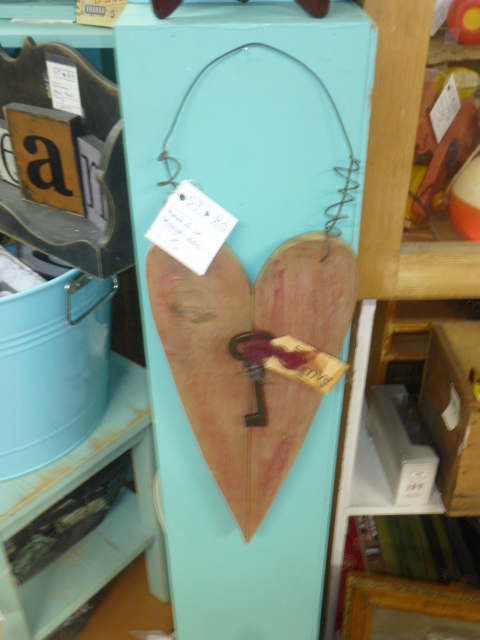 Rustic wood hanging heart with key. 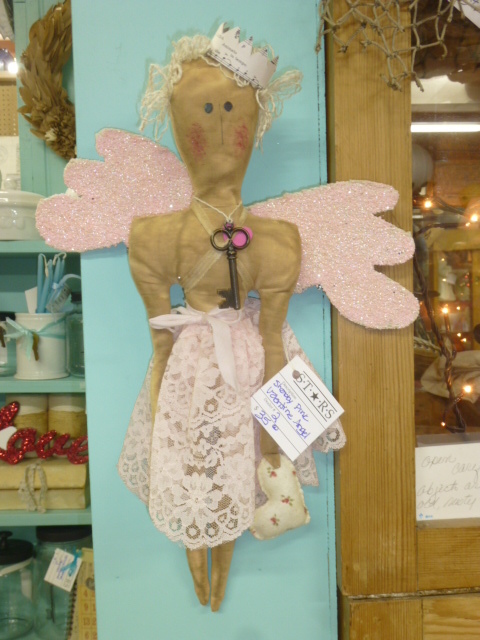 One of a kind pink Valentine fairy. 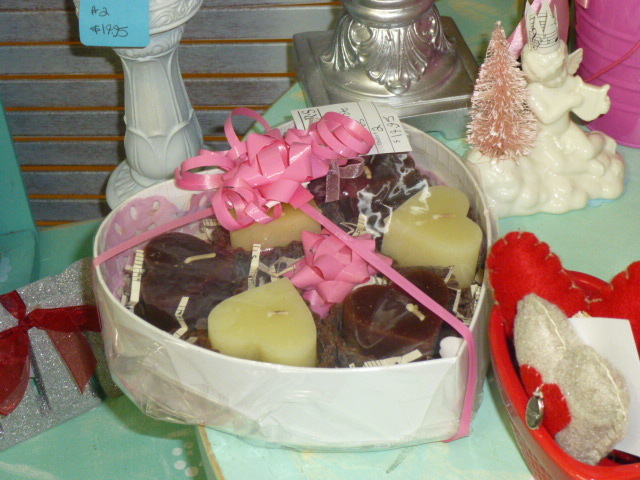 Altered vintage candy boxes filled with chocolate CANDLES! 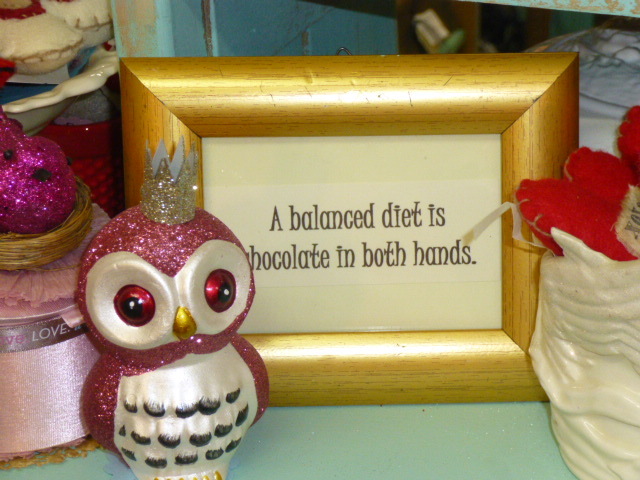 Perfect for those of use who have resolved to get into shape in the new year! 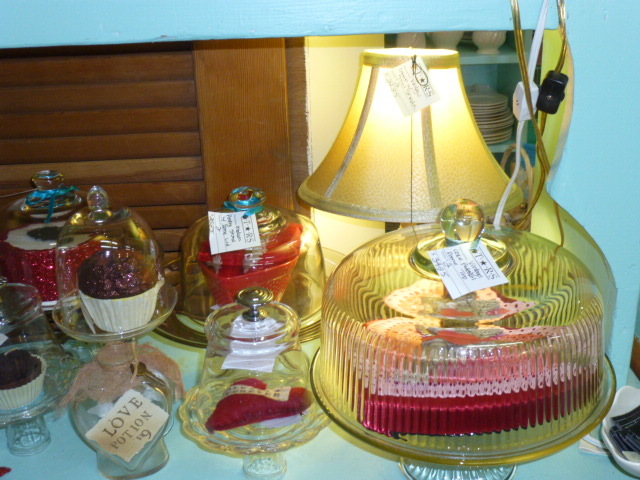 Several to choose from. 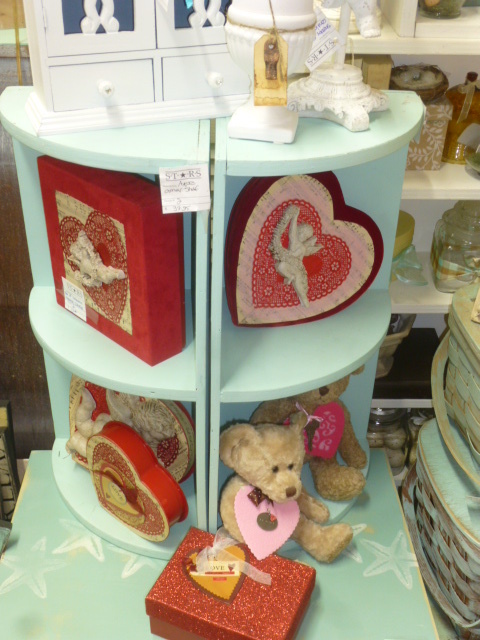 Vintage bears with hearts and keys. 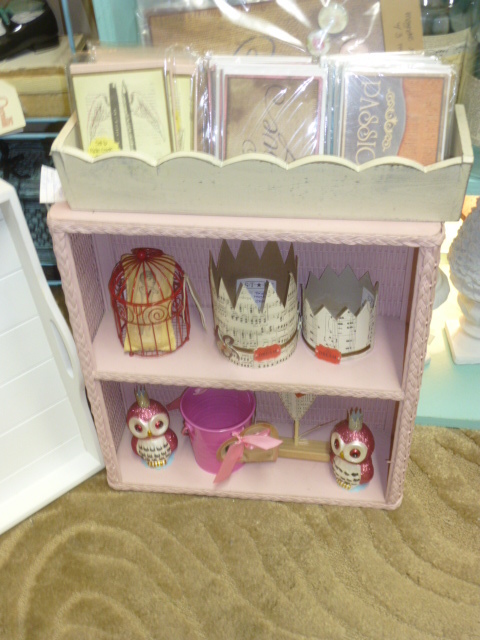 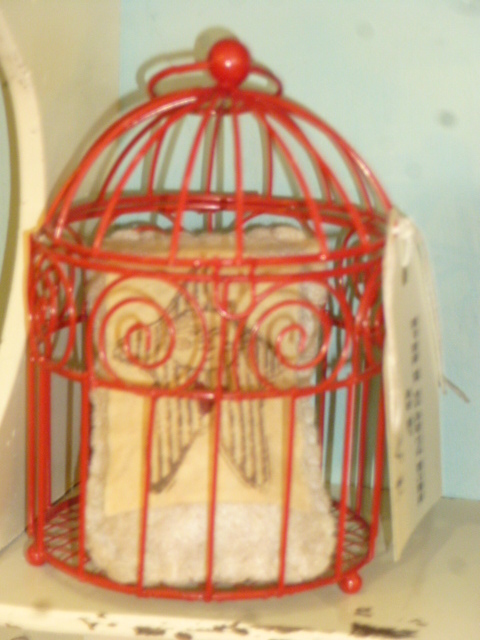 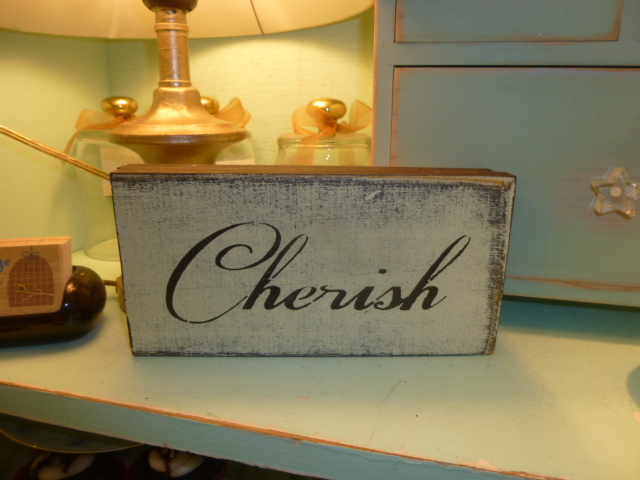 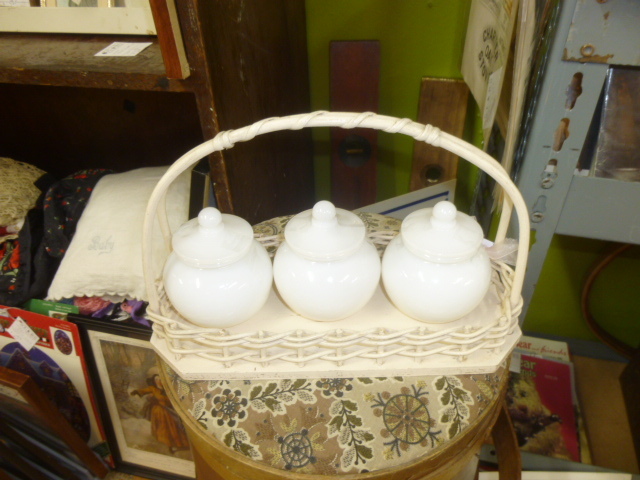 Vintage pink wicker shelf; packets of blank note cards on top. 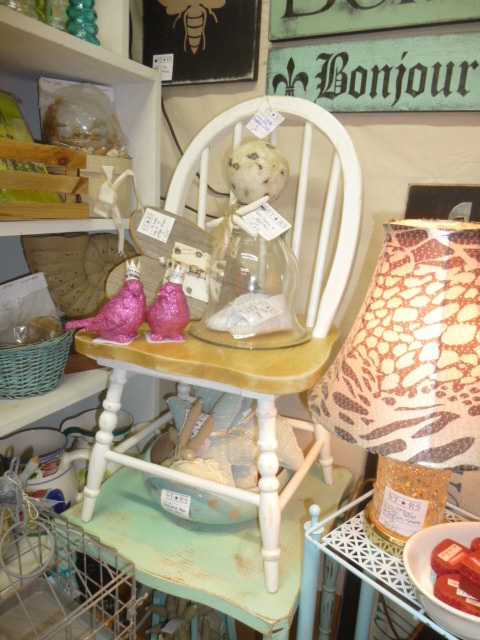 Pair of pink glittered birds sitting on a sweet child size bow back chair. 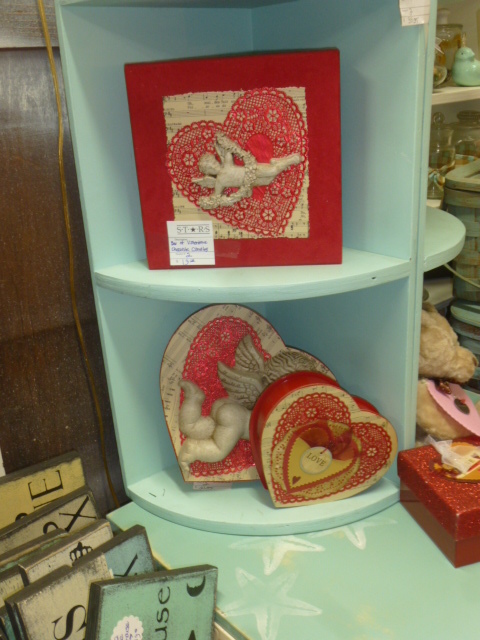 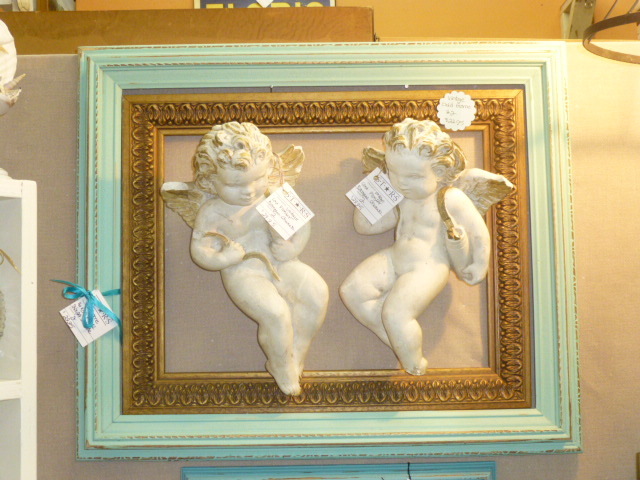 More love sign and little cherub. 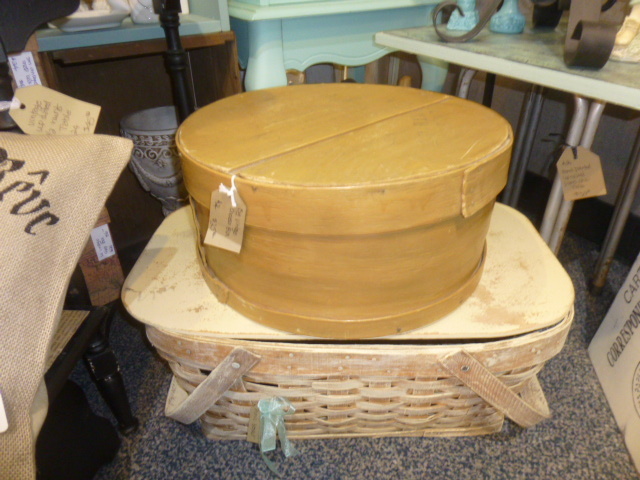 Big beautiful (heavy too!) 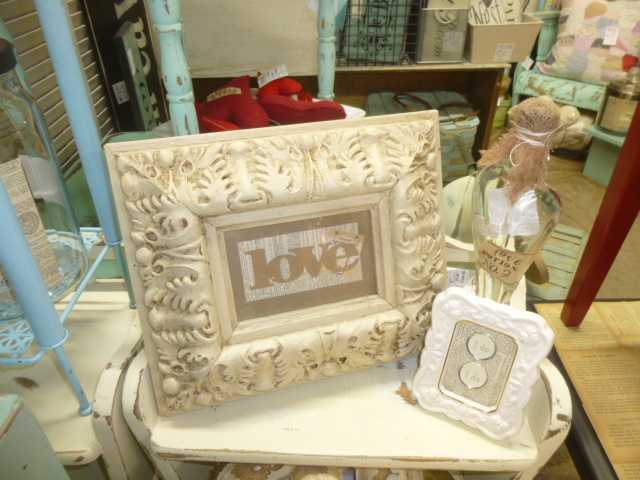 shabby chic frame with love collage. 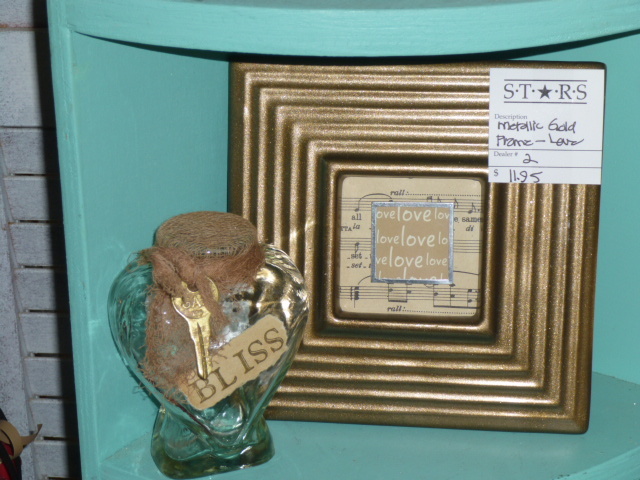 The love collage is removable so you can use the frame for a picture after Valentines Day. 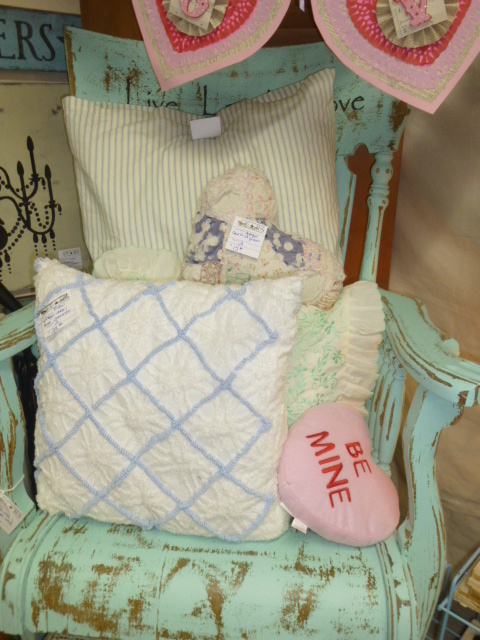 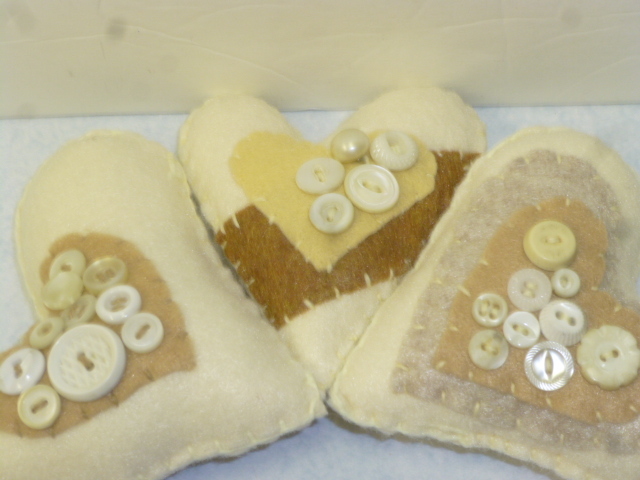 Little ‘Be mine’ heart shaped pillow. 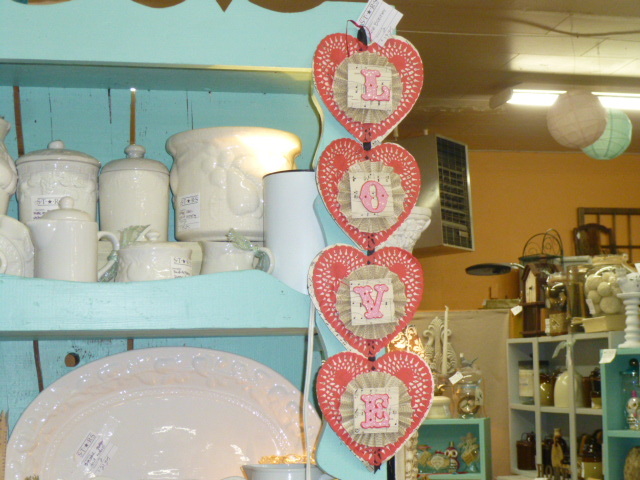 Love heart banner and 2 doves Valentine wreath. 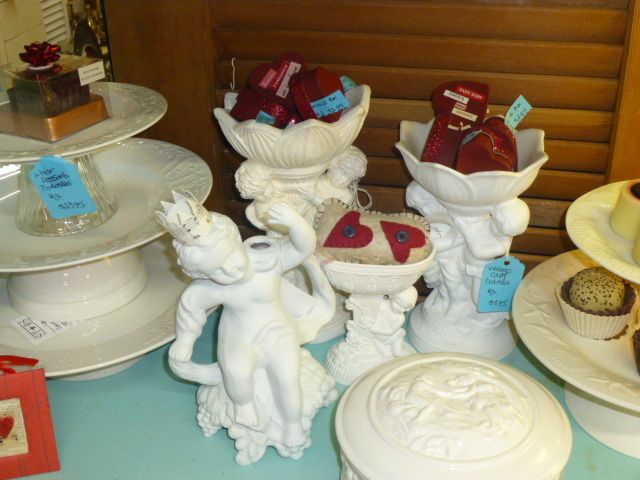 Many of the Stars dealers will be on hand ‘wheeling and dealing’ throughout the sale. 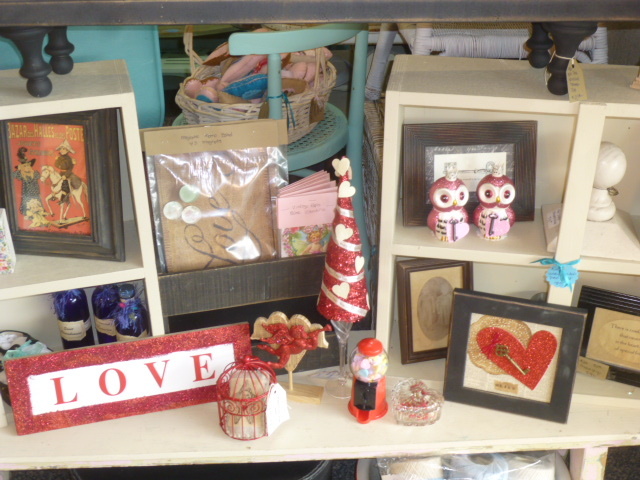 Since I can’t be there to offer individual deals, I’ll be offering 25% off ALL REGULAR PRICED MERCHANDISE in my booth. 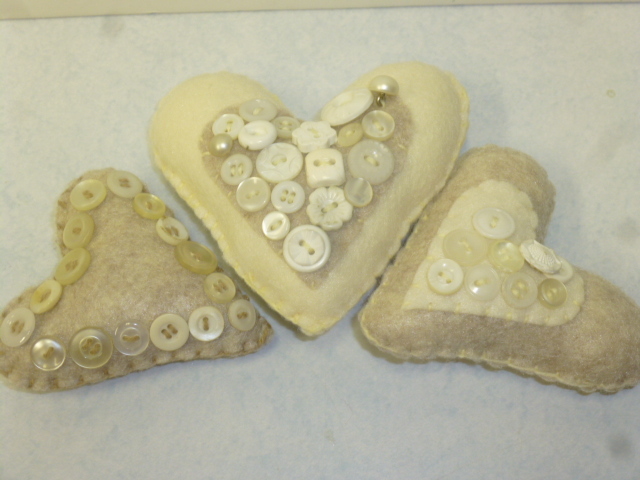 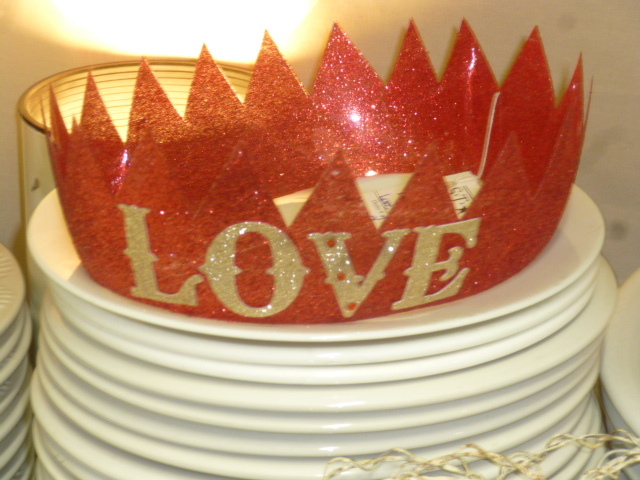 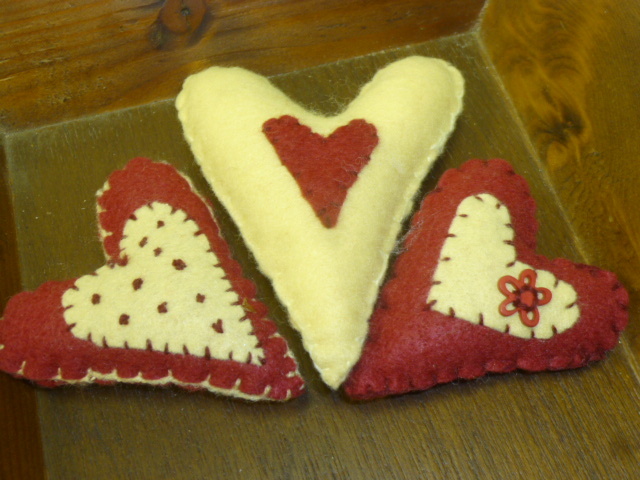 I have sold quite a bit of the Valentine stuff, but there is still plenty left! 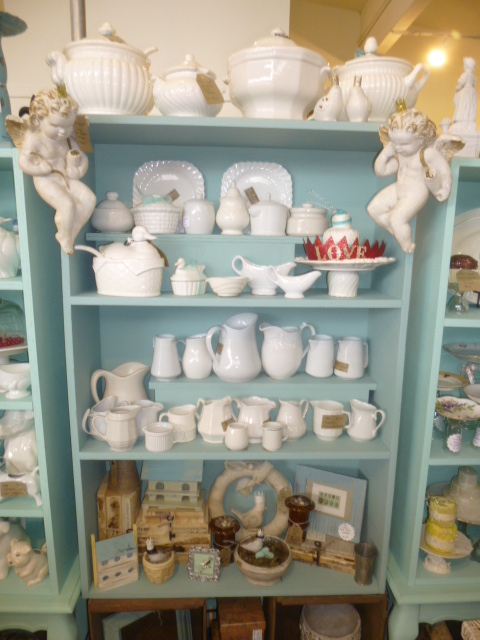 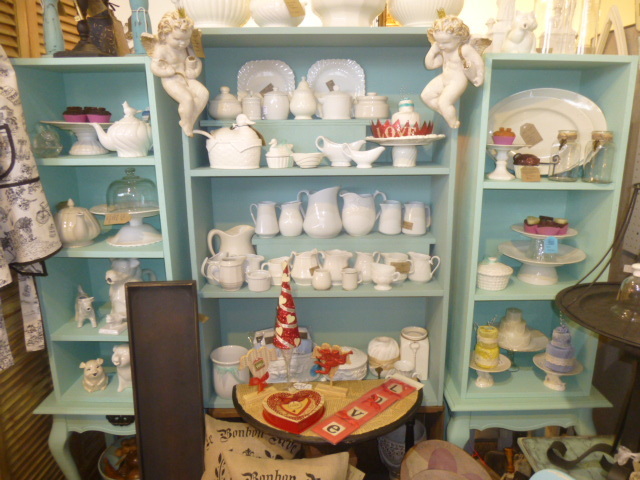 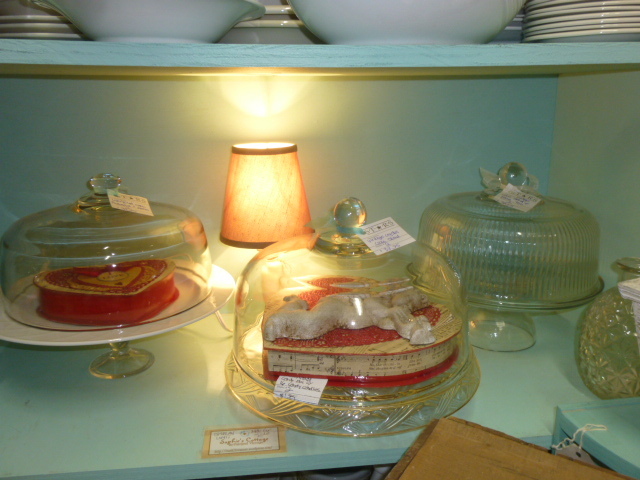 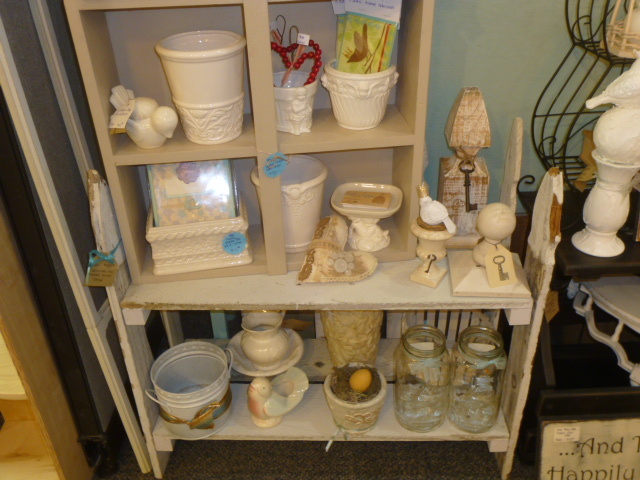 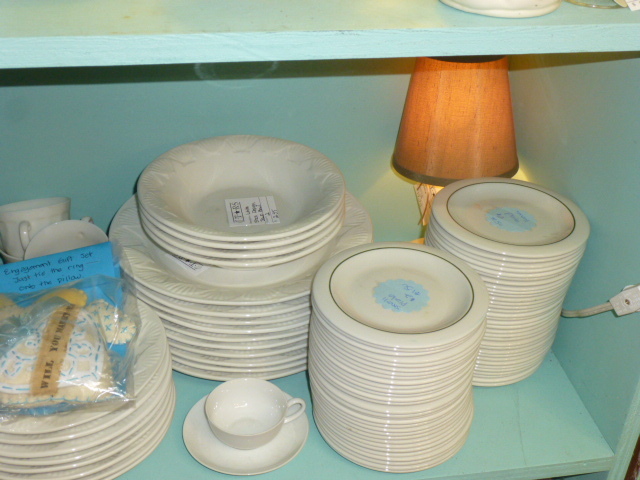 And, as always, a plentiful selection of vintage Ironstone and other white dishes. 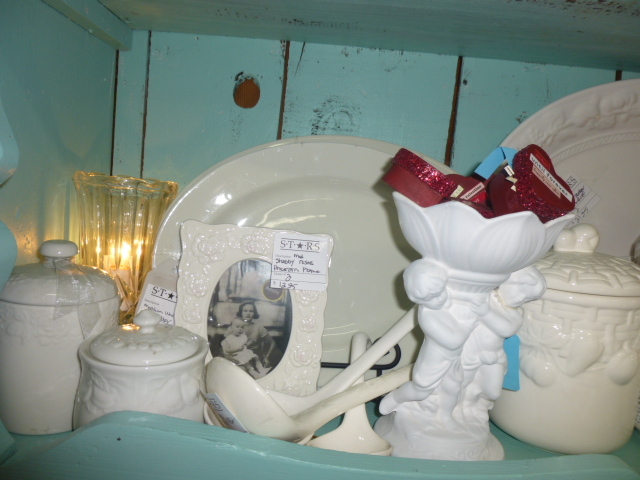 LOTS of these little vintage English Ironstone dessert plates! 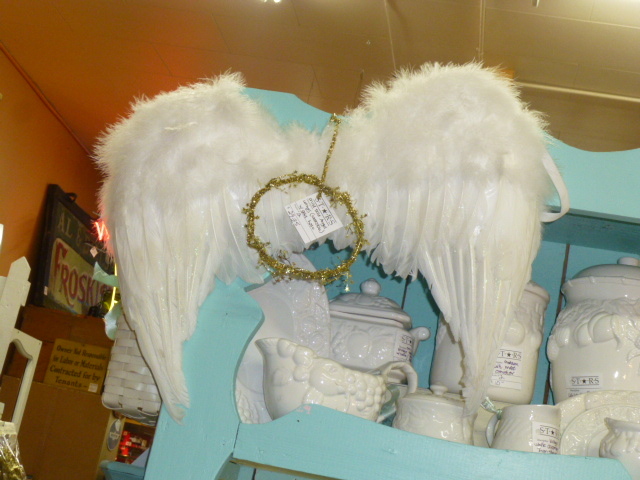 Soooooooooooooooo pretty white feather angel wings with gold halo. 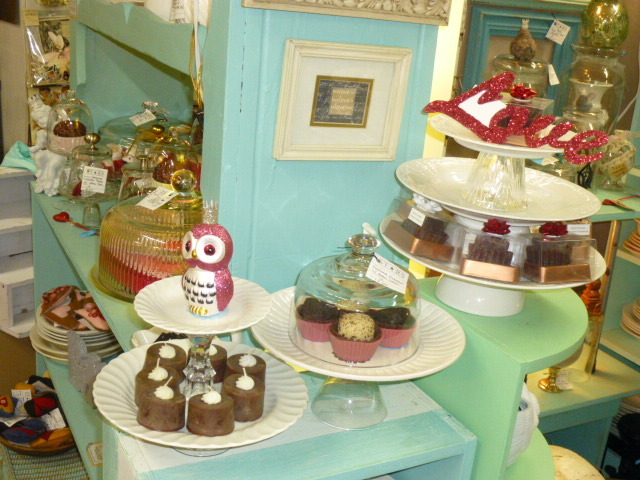 LOTS of dessert stands. 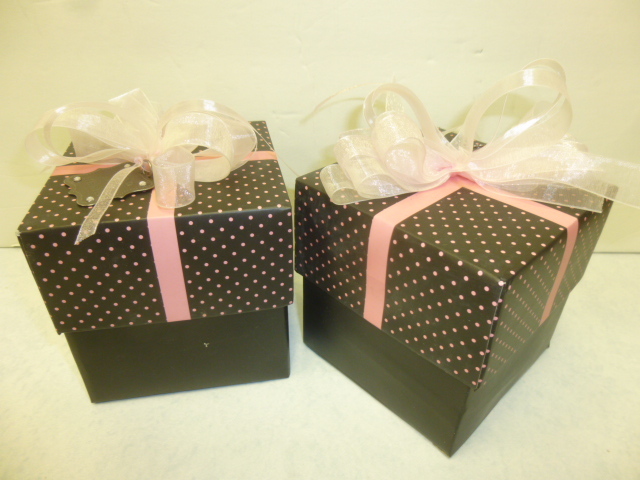 Full cake size to indicidulal cupcake size. 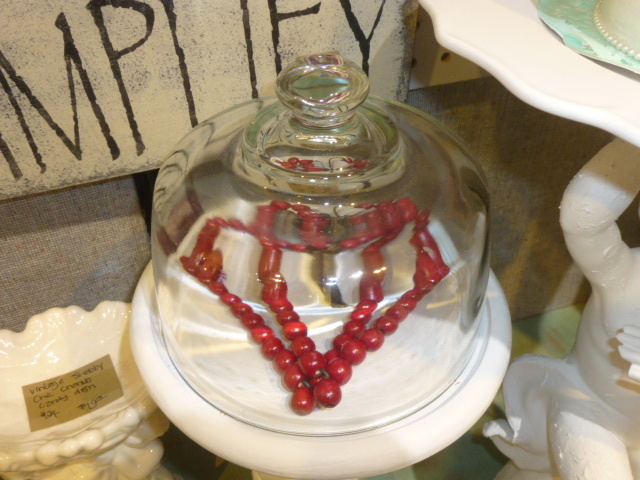 With and without dome tops. 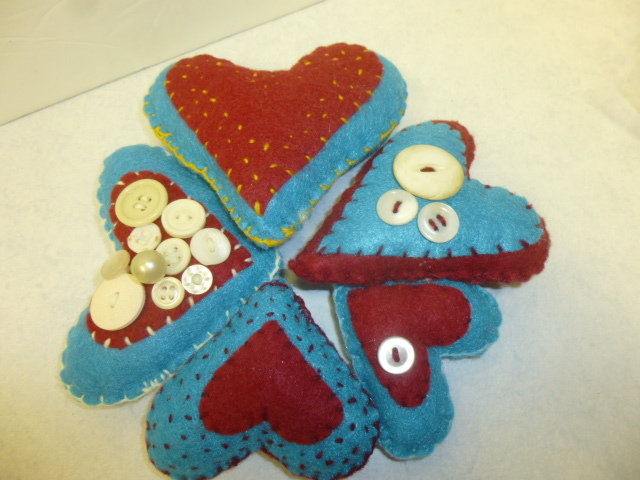 Single and multi layer. 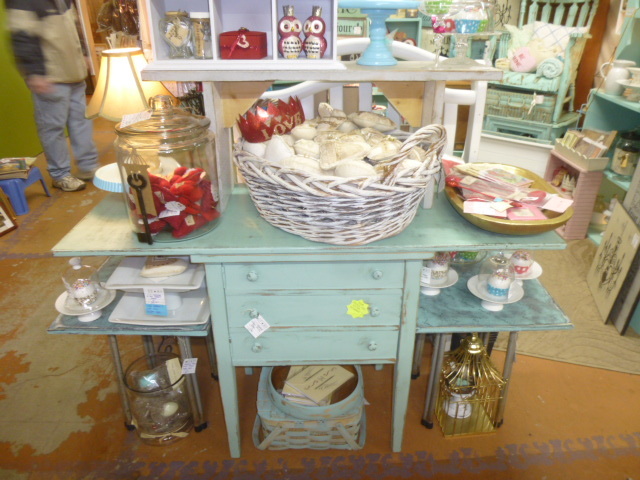 Perfect for your next dessert buffet. 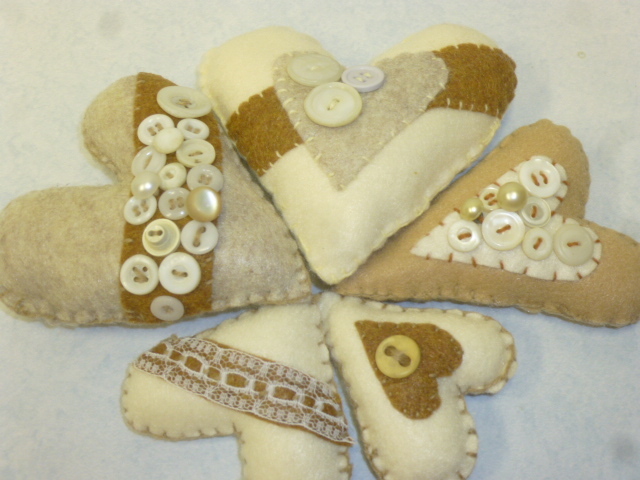 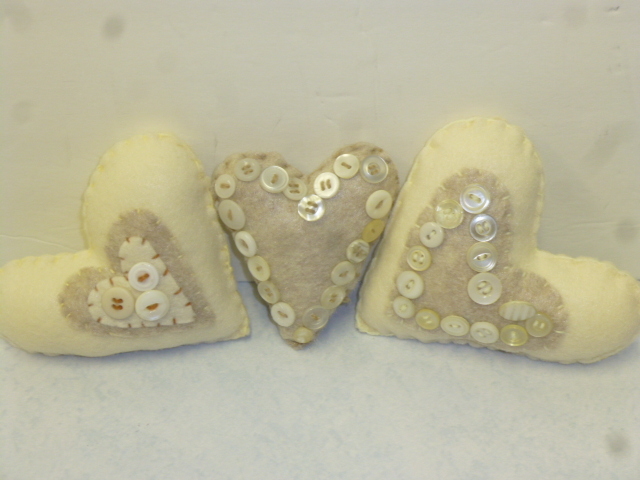 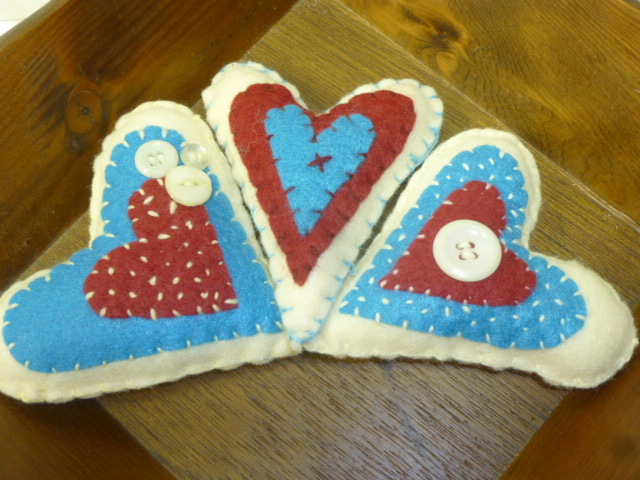 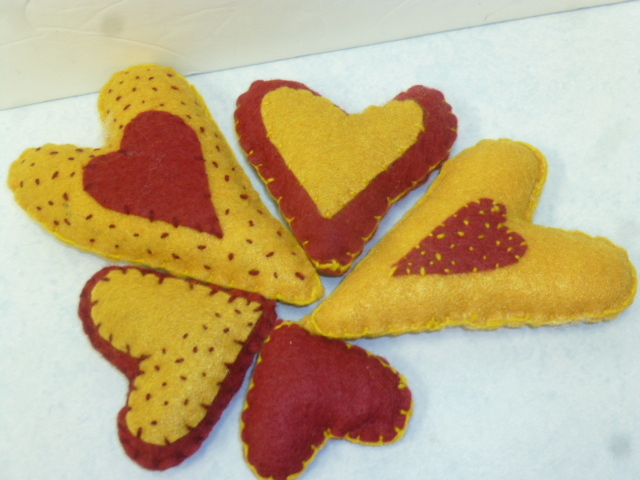 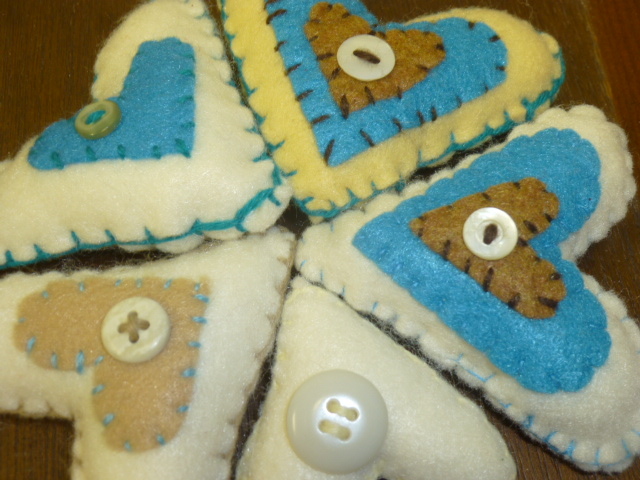 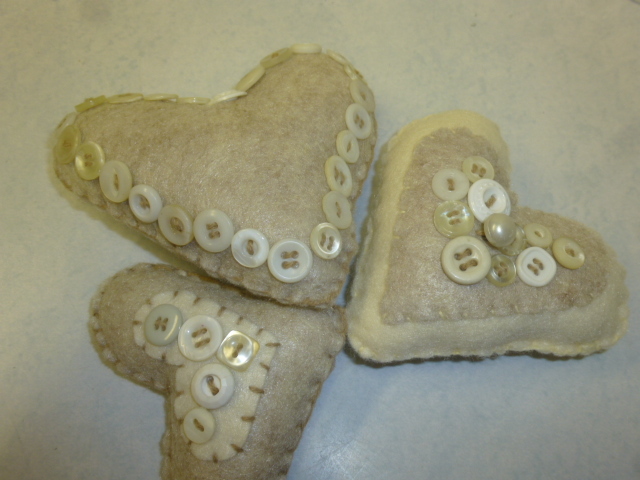 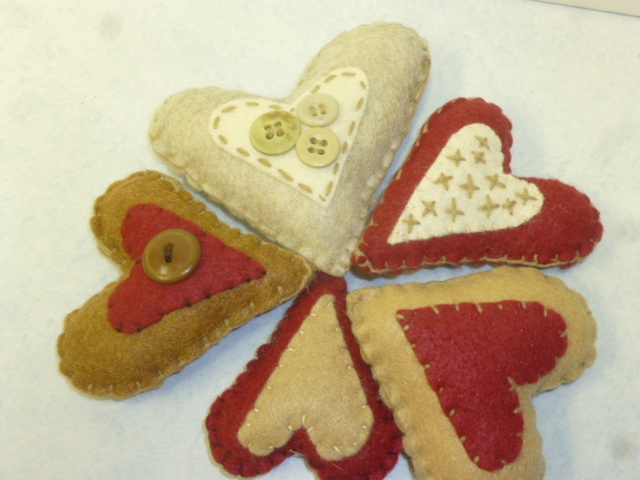 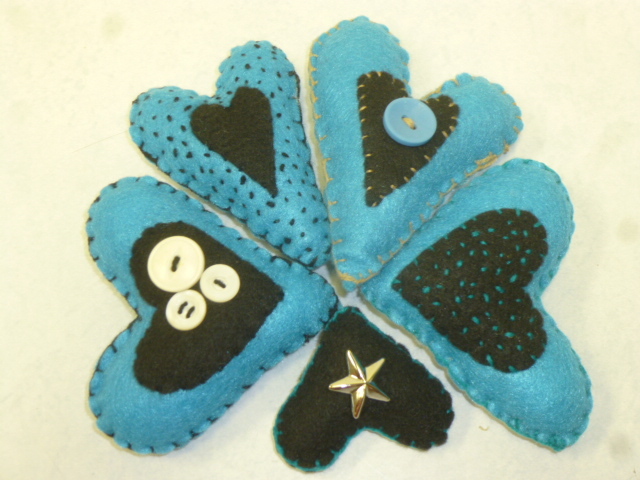 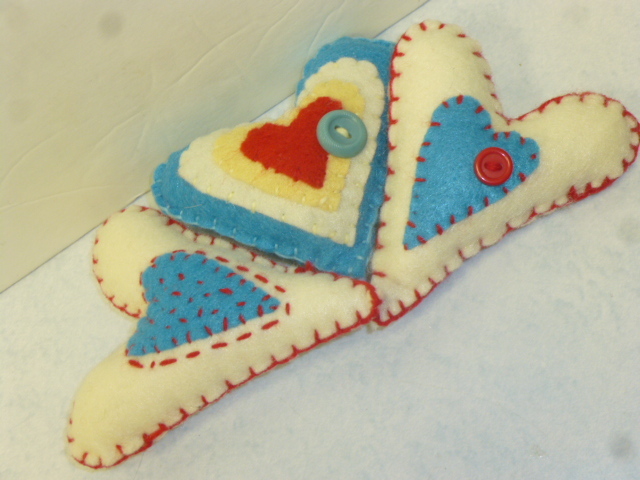 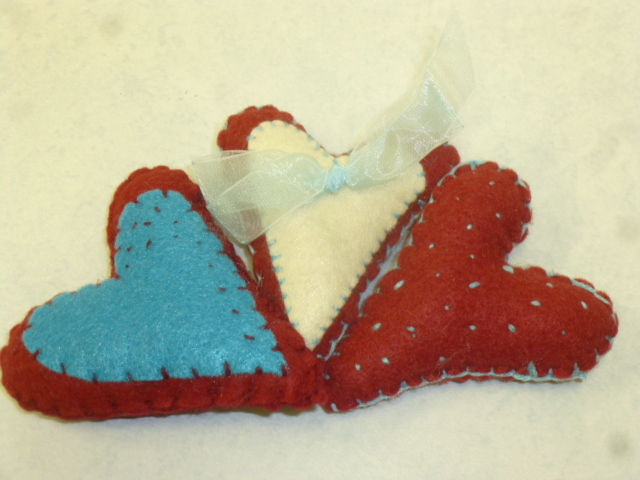 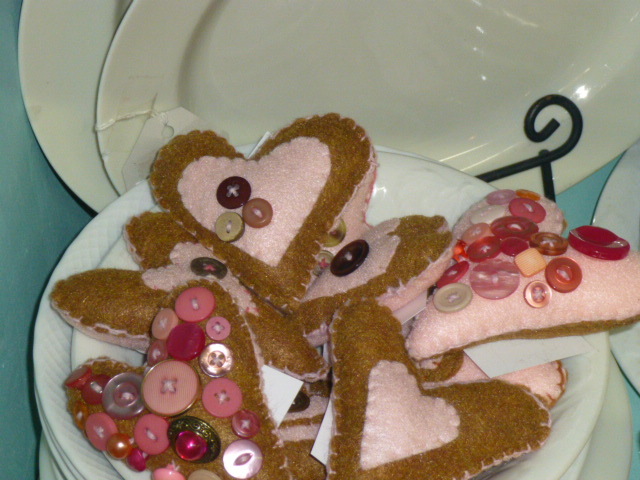 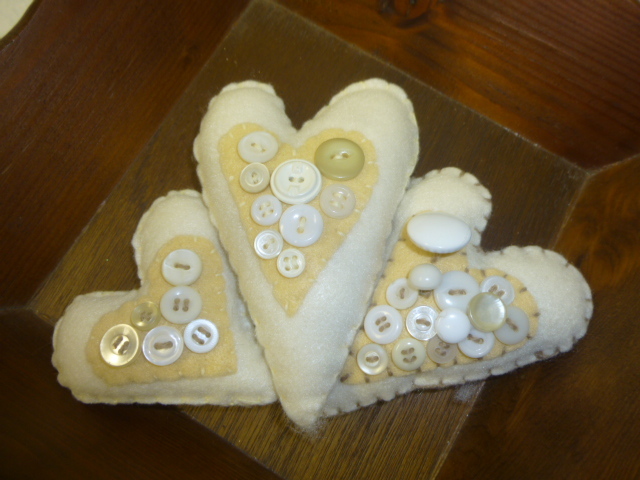 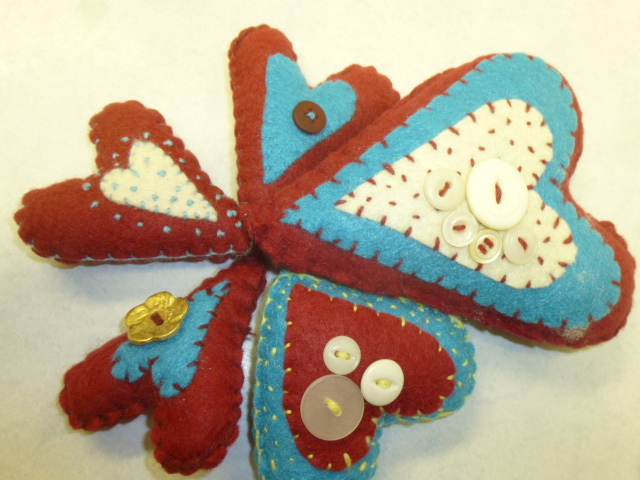 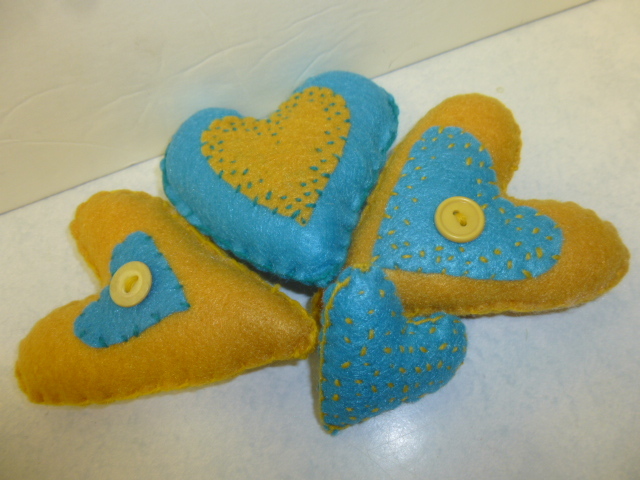 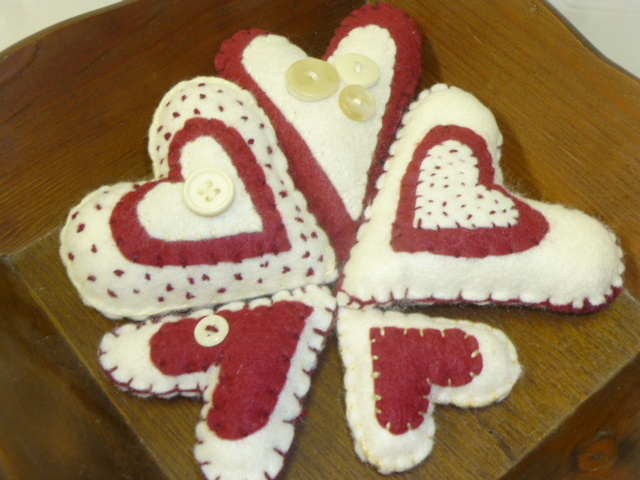 New batches of the felt hearts; in pink and brown. 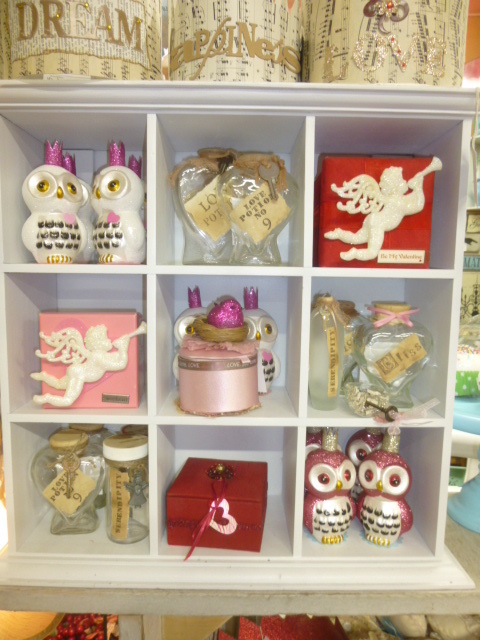 And cute containers to display them in! 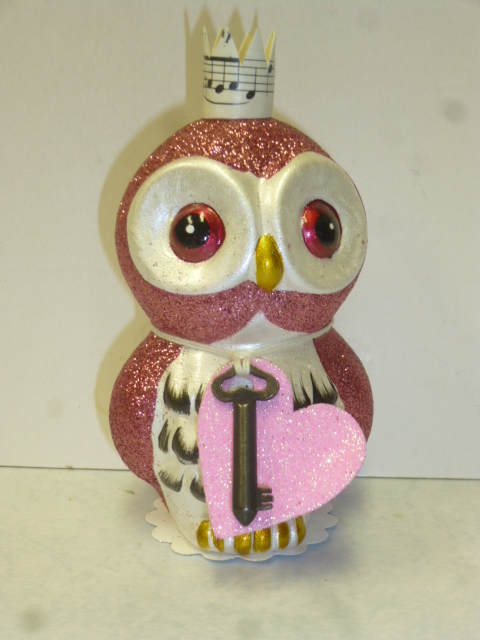 Pink glitter owls with crowns. 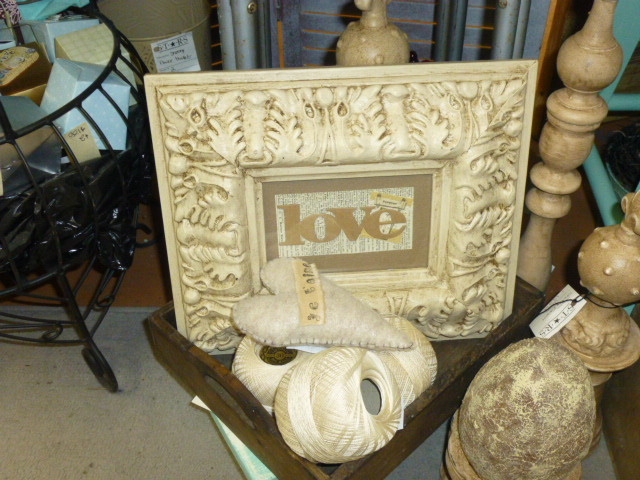 Neutral tones more for year round display. 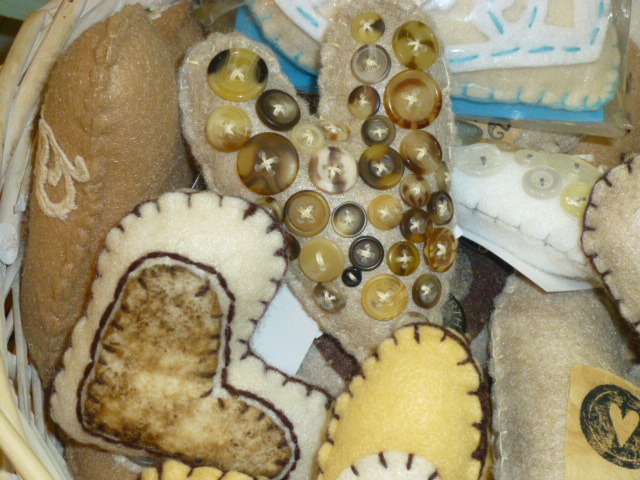 Yes, it DOES take a long time to sew all those buttons on! 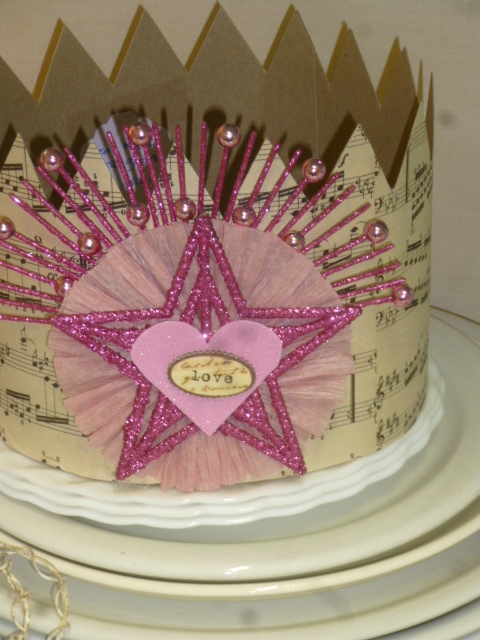 But I love the end result!! 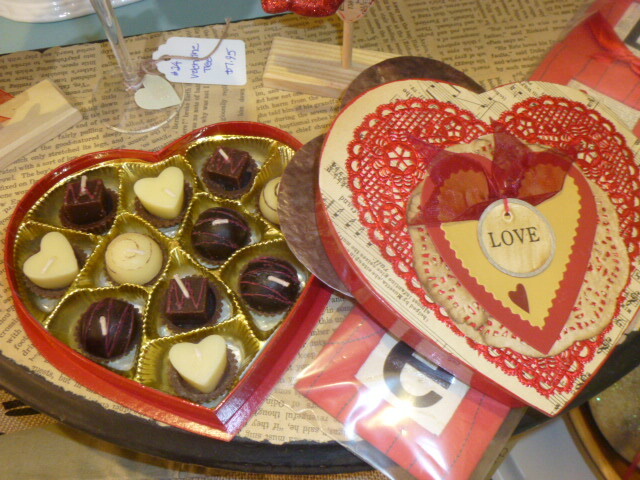 Another batch of darker reds. 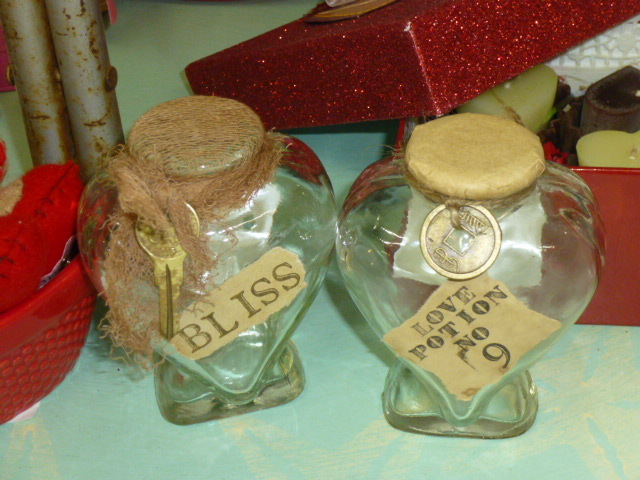 Love potion and bottles of Bliss. 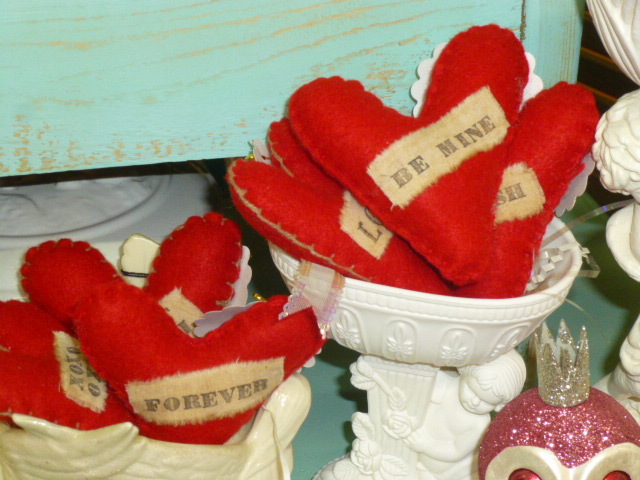 Whites that can be given for Valentine’s Day and displayed year round. 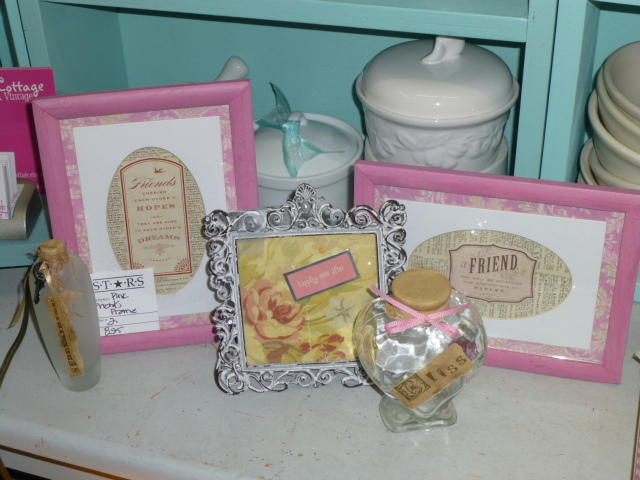 Pinks and signs for friends. 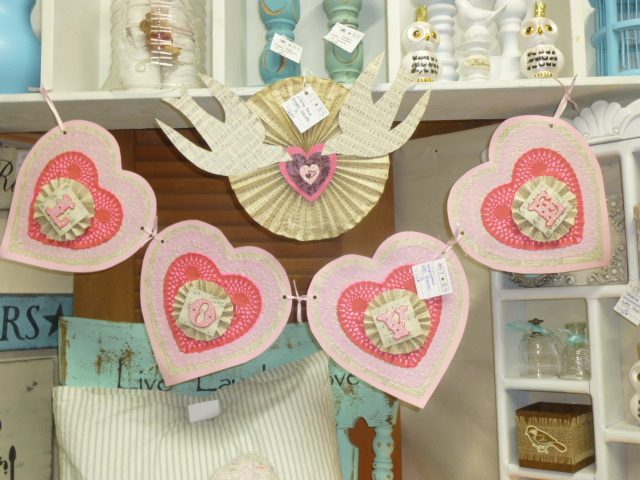 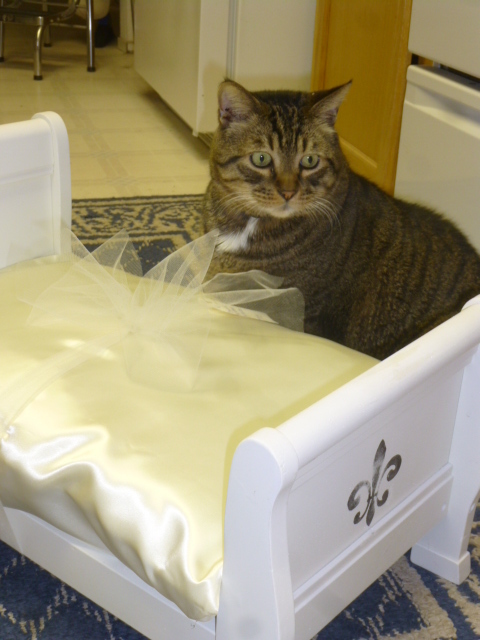 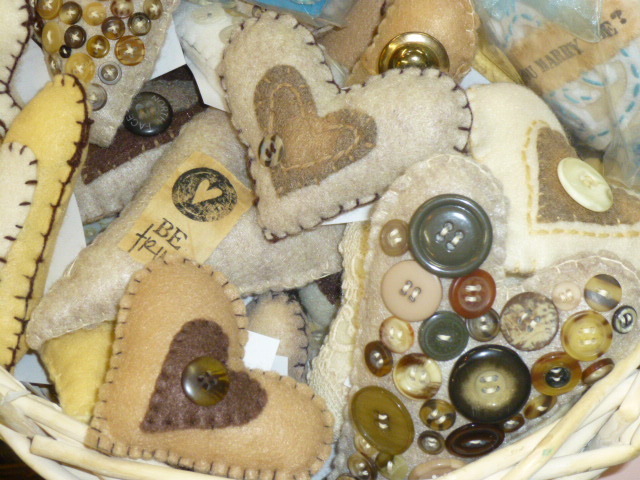 Stop on by and ‘shop to your hearts content’!